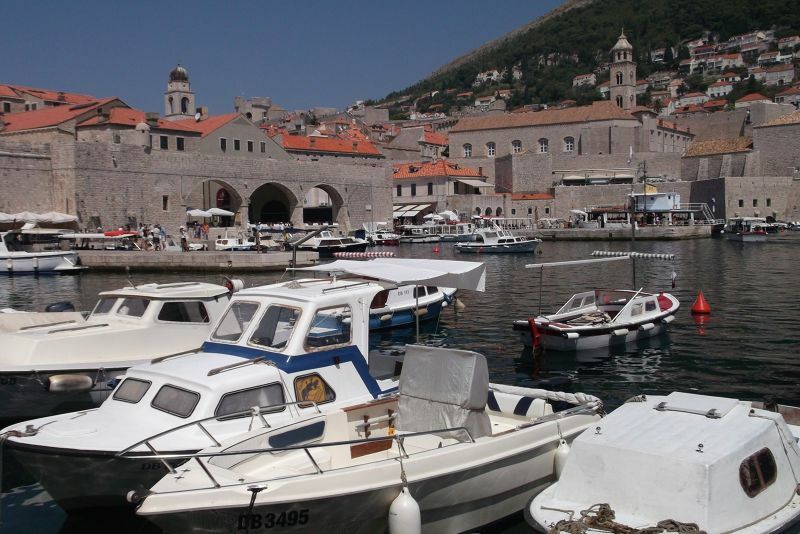 Croatia - Trips to the Balkans. 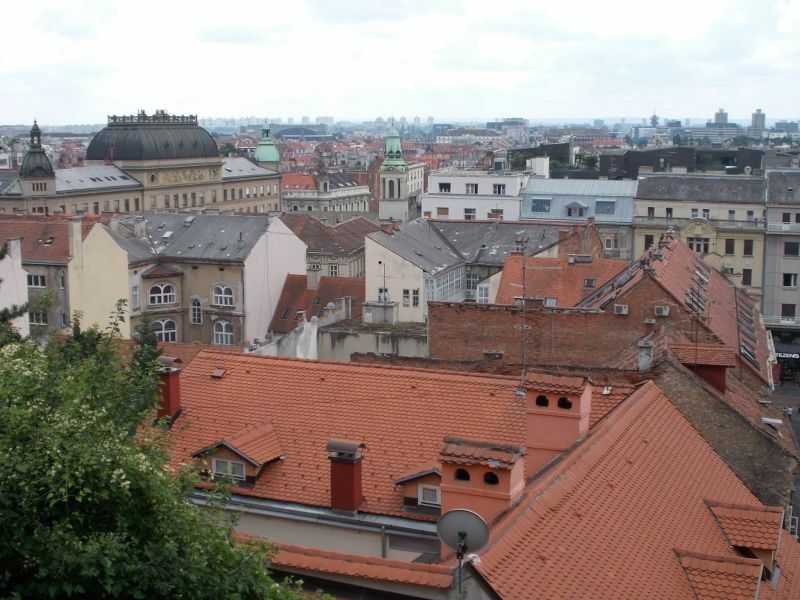 Zagreb was the last port of call of our two and a half weeks of travels around Europe in the summer of 2014, so we arrived there absolutely exhausted. 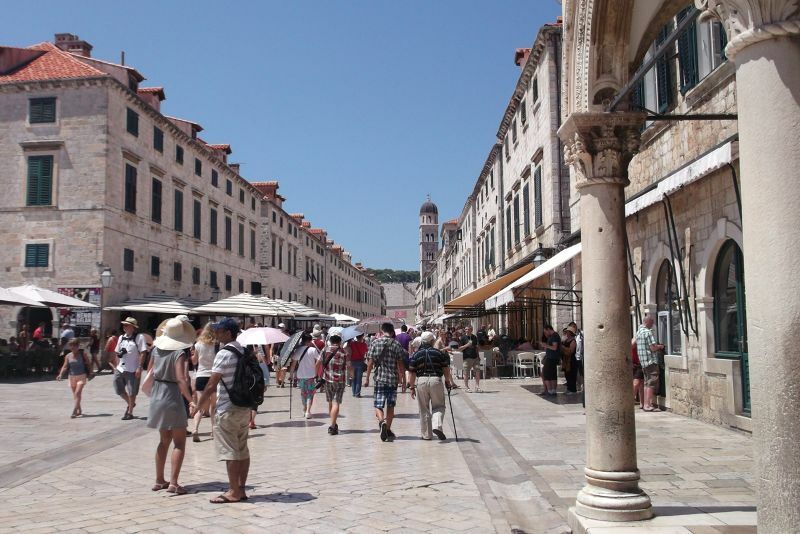 Fortunately, it is a very manageable city with most of the attractions within easy walking distance of each other, so we did manage to see a lot of it at a relaxed and enjoyable pace. 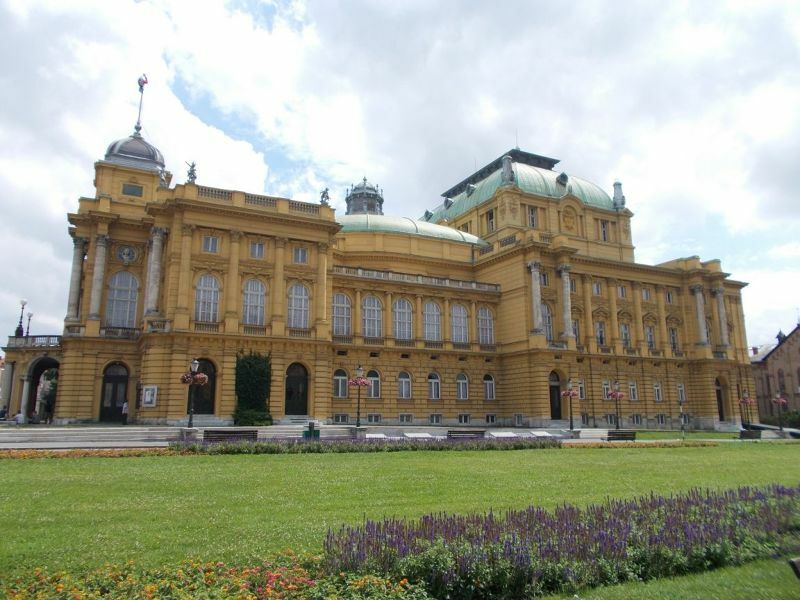 Zagreb was a city of outdoor cafes, restaurants, green spaces and vast, impressive, ornate buildings. 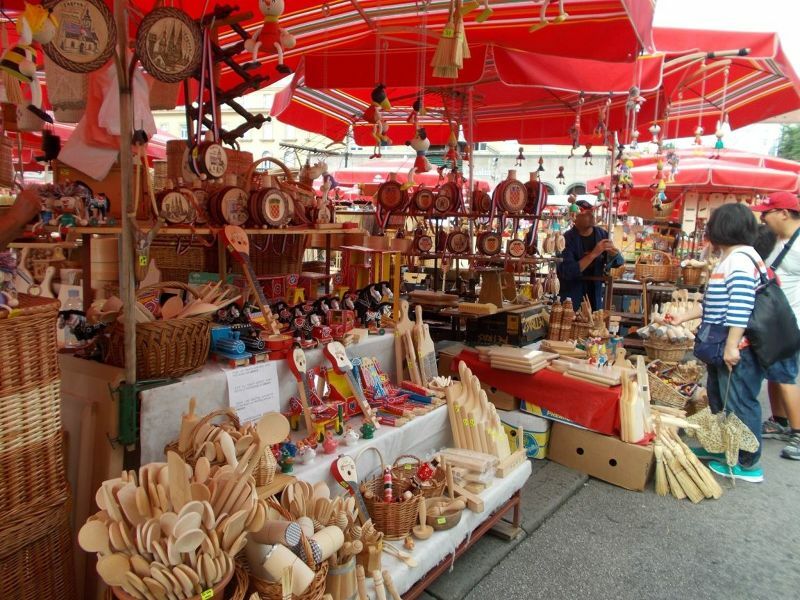 Old Zagreb consists of two areas: Kaptol with its wonderful cathedral and colourful market; and Gornji Grad with its towers, funicular and St Mark’s Church. These two areas were originally different towns separated by a river. They were rivals and sometimes fought each other. 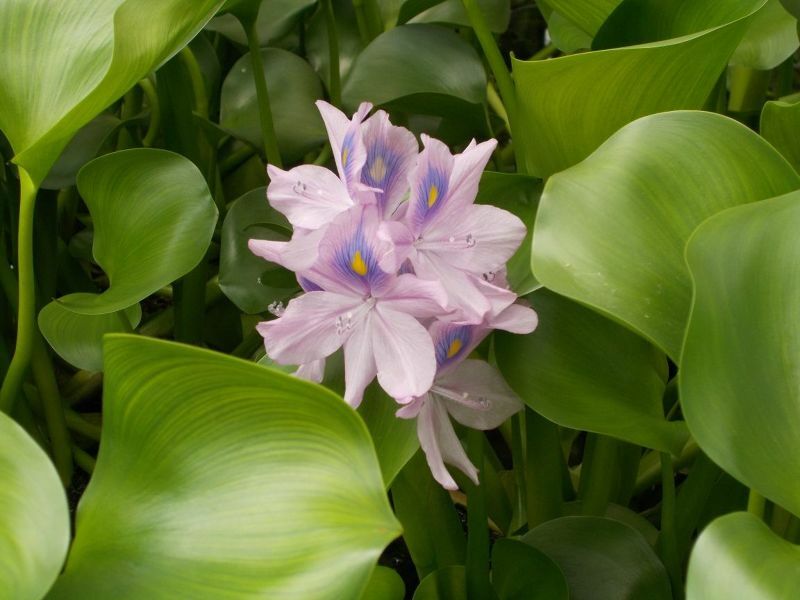 There is also a beautiful green horseshoe shaped area with botanic gardens forming the bottom of the U shape. 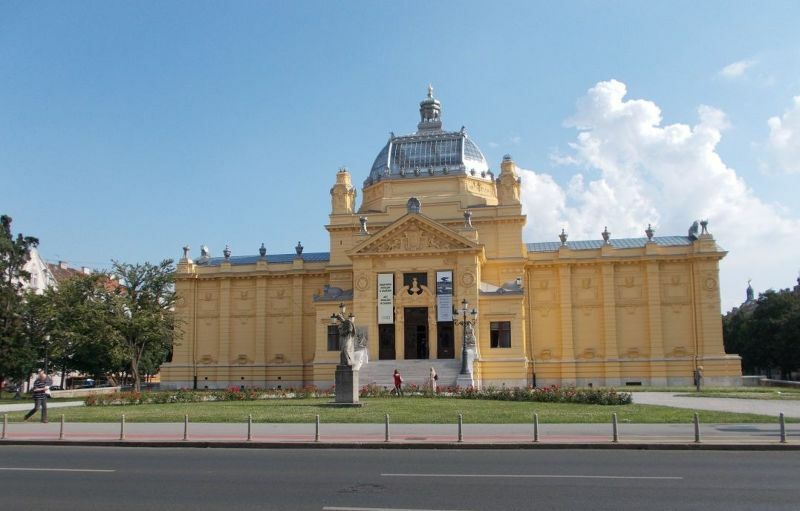 One prong formed by Trg Kralja Tomislava and Trg JJ Strossmayera with their art pavilion. 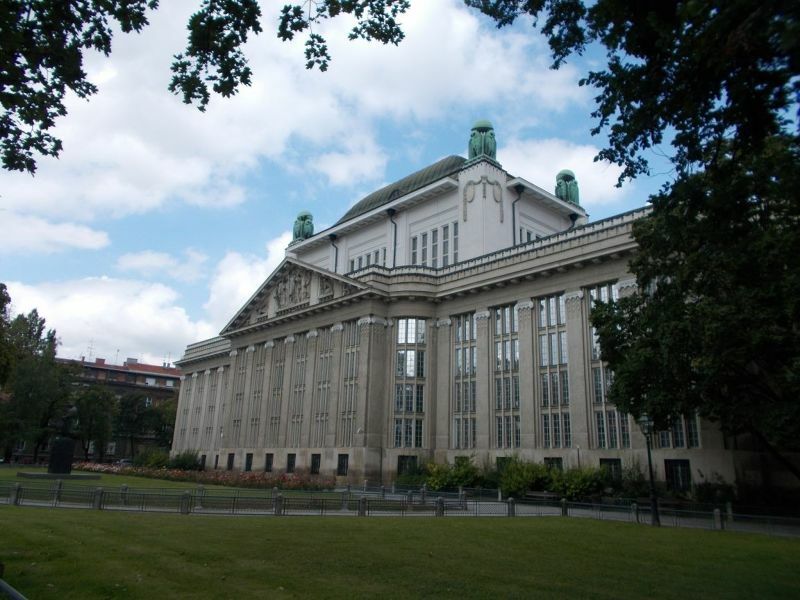 The other prong formed by Trg Marka Marulica, Trg Antuna, Ivana i Vladimira Mazurinanica and Trg Marsala Tita with its theatre and state archives. 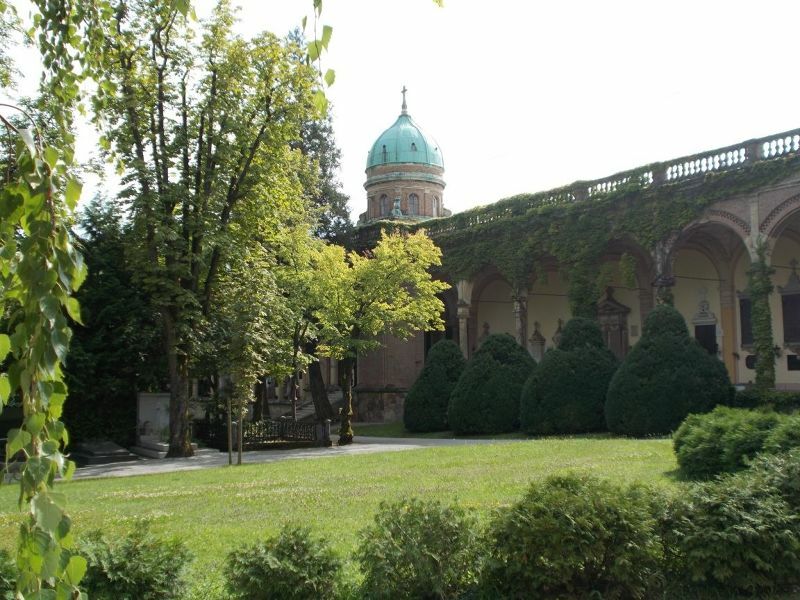 Our only forays off the beaten track were to visit the stunning Mirogoj Cemetery with its ivy clad domes. We had intended to also try to get to the lakes at Jarun for a swim, but we did not manage that. 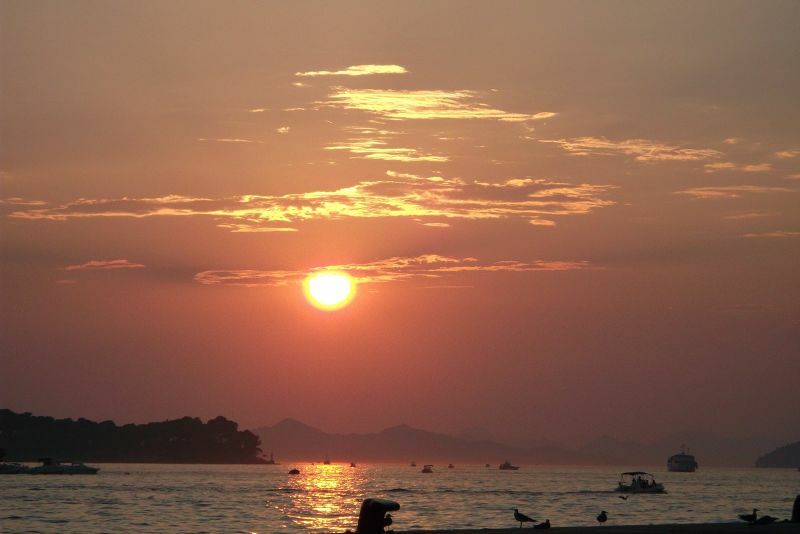 This was our second visit to Croatia. 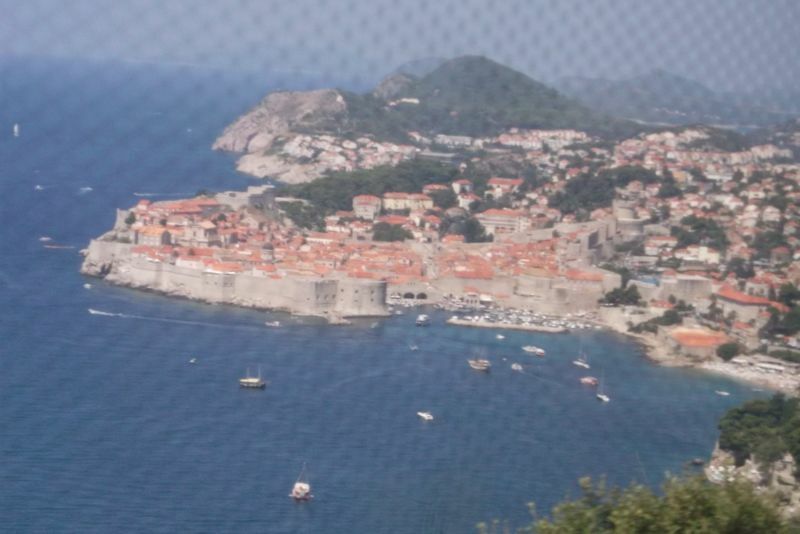 Last year we spent three nights in Dubrovnik. 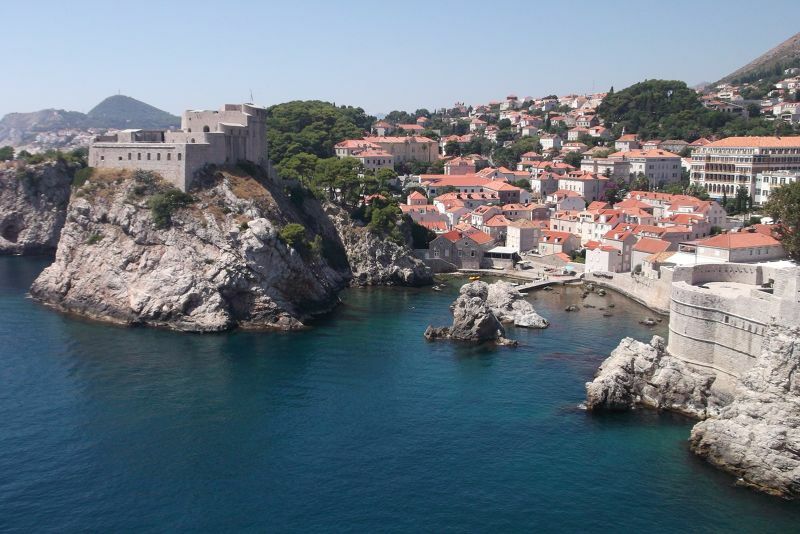 Personally, I vastly preferred Zagreb to Dubrovnik. 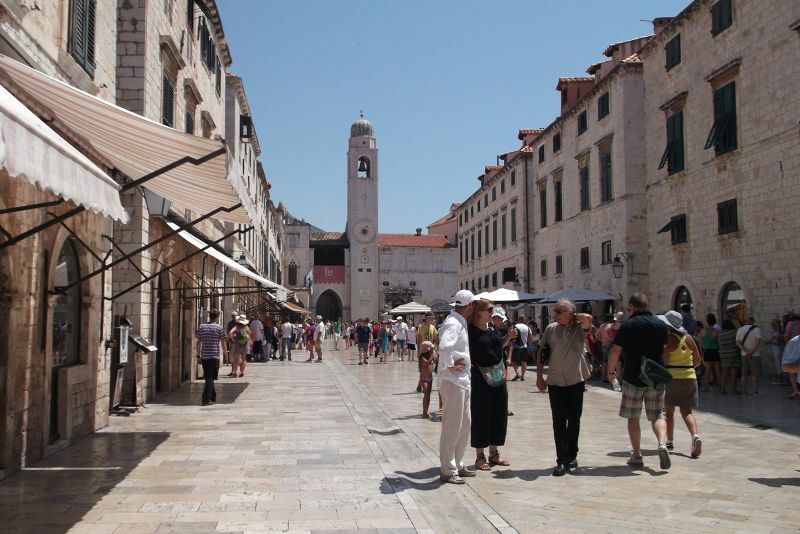 It was cheaper, friendlier, less touristy and much more a real, lived ­in place. Back in the eighties I almost ended up in Zagreb by accident when I took a Yugoslavian Airways flight from London to Istanbul. I knew the plane landed in Belgrade and that I had to change planes there, but I did not know it landed in Zagreb first and almost got off there. 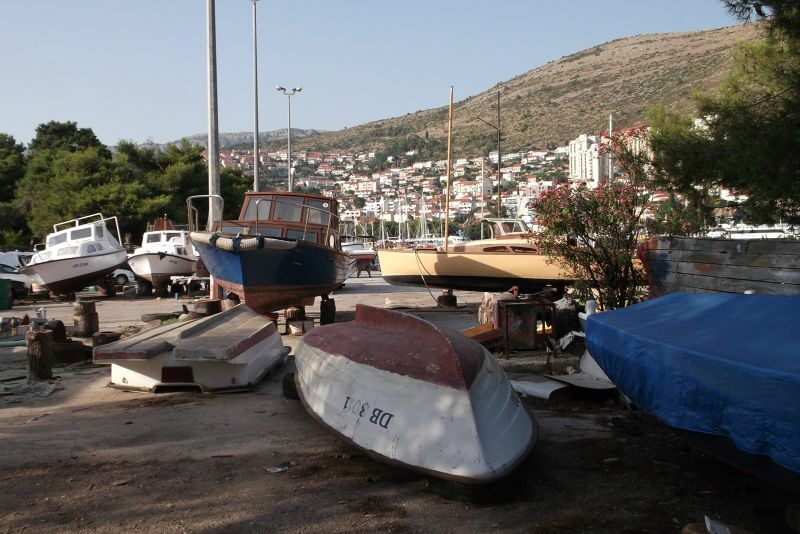 It was fortunate I had been chatting to a Croatian man who told me where we were and that I was to sit back down. We stayed in this hotel for two nights in July 2014. 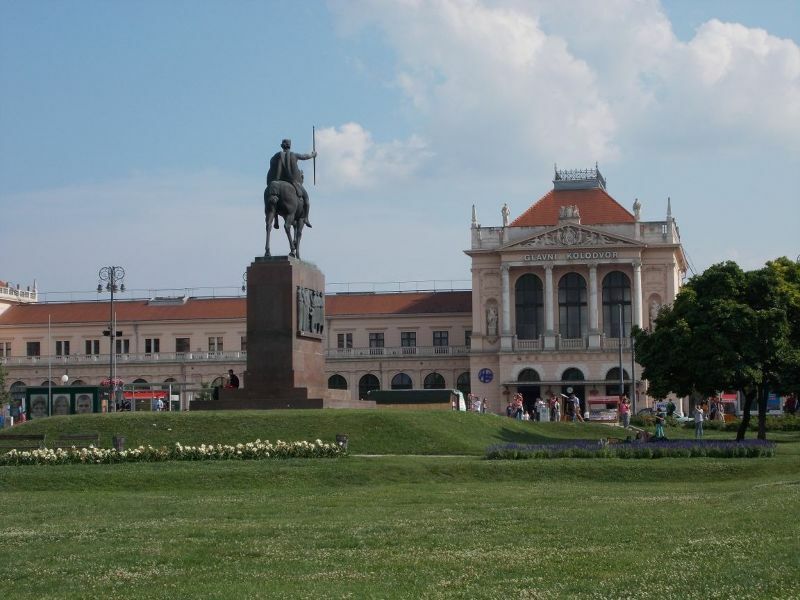 The hotel is close to Zagreb's main train station. Exit the station and go right to find the hotel. We were able to check in at 11 am without any problems. Check­-in was reasonably friendly. Our room was fine. 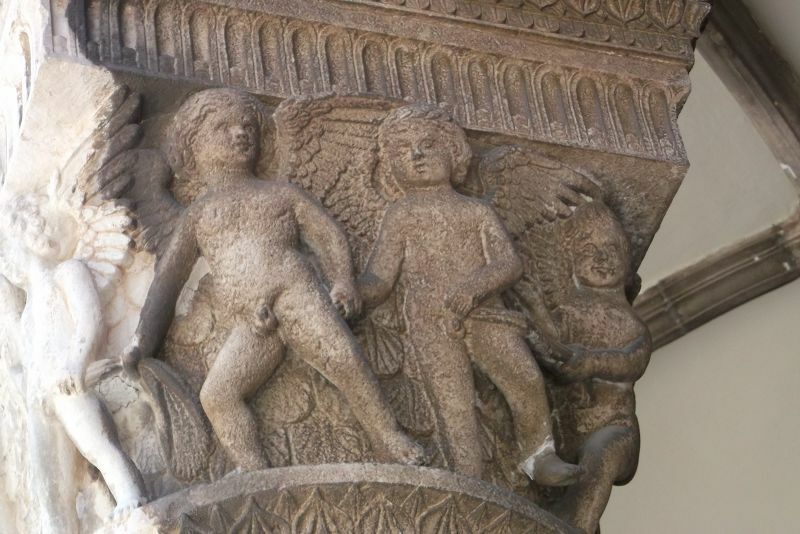 It was at the top of the hotel and had a few oddly placed pillars. I suppose the decor was a bit dated, but such things do not bother me. It was clean, comfortable and quiet. We slept really well here. 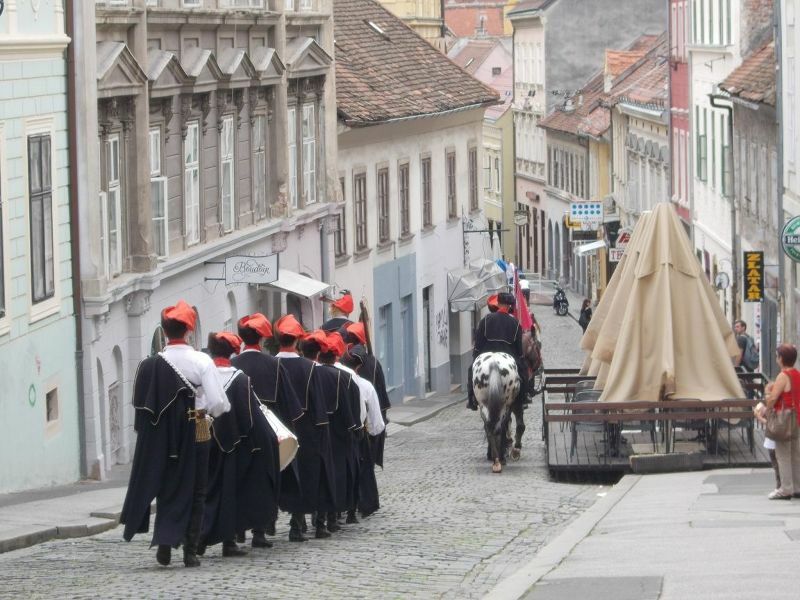 The hotel's location is also great for the historic centre of Zagreb which you can very easily get to on foot. The bus station is about 15 minutes walk away or you can take a tram. There are tram stops near the hotel. The breakfast staff at the hotel were pleasant and friendly. Food at the hotel was fine with various breads, cheeses, meats, cereal, fruit. The big negative was that the coffee was awful. The liquid they called coffee only resembled coffee in colour. It neither smelt nor tasted like coffee. As someone who needs three coffees to get going in the morning, even I was on the tea. Wifi was rather unreliable at this hotel. It worked on and off and was not consistent. We would be happy to stay here again. Address: Branimirova 3, Zagreb . 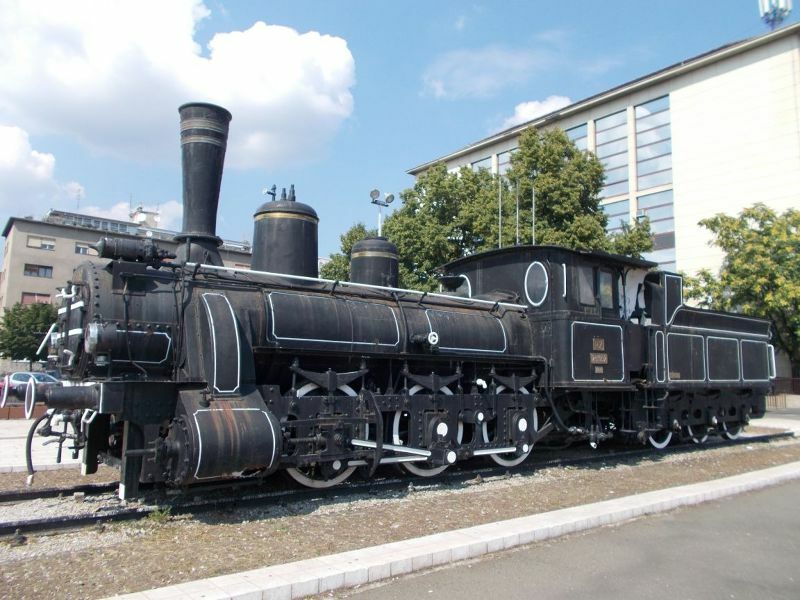 An old locomotive steam engine is located outside Zagreb's Main Train Station. We also noticed when we were in Slovenia that Slovenian stations also always had an old engine on display. 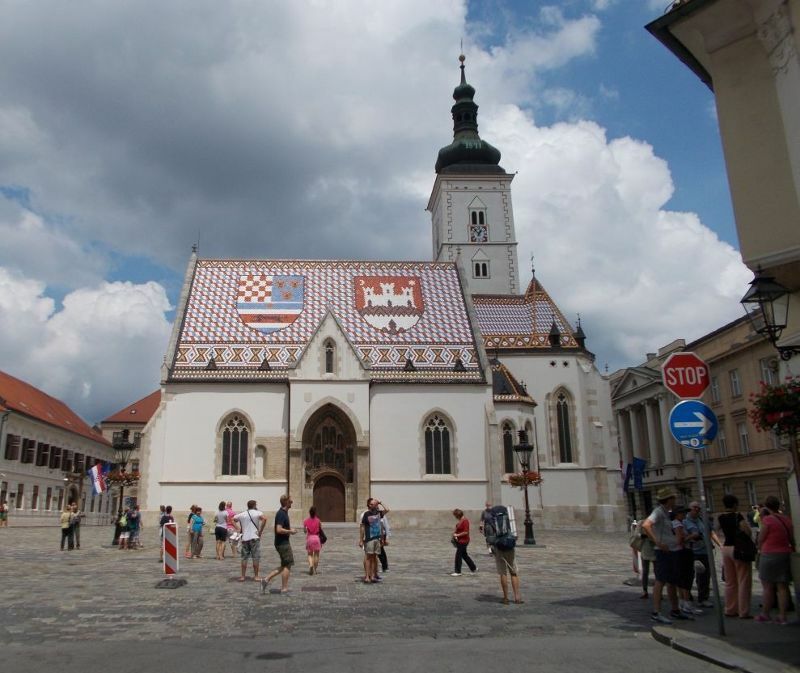 Zagreb Cathedral’s full name is the Cathedral of the Assumption of the Blessed Virgin Mary. 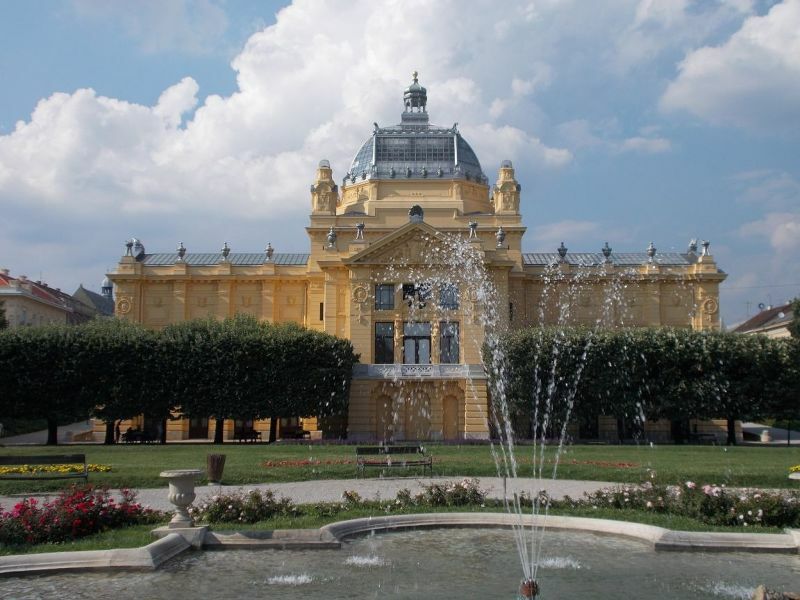 It is a beautiful building located in the Kaptol part of the city. The cathedral has two tall spires which can be seen from a long way away. One of the spires was being restored during our visit. 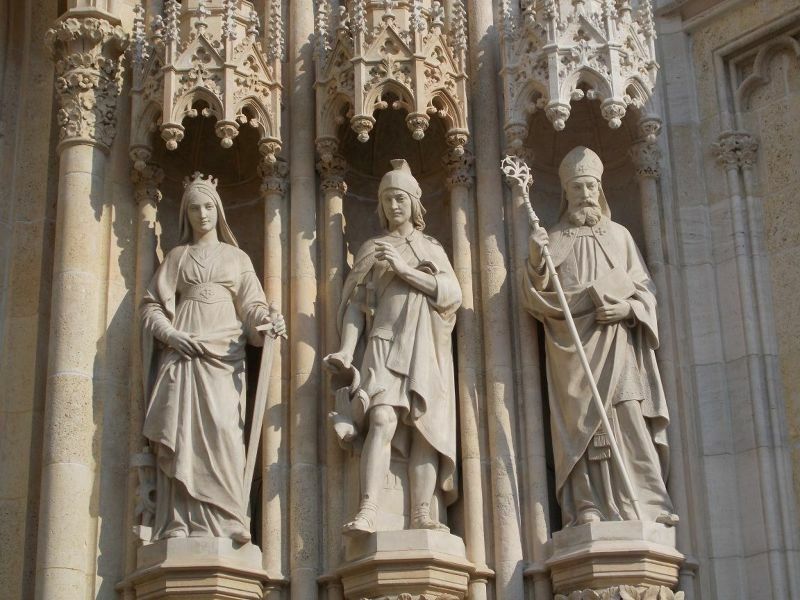 The cathedral dates from 1093. 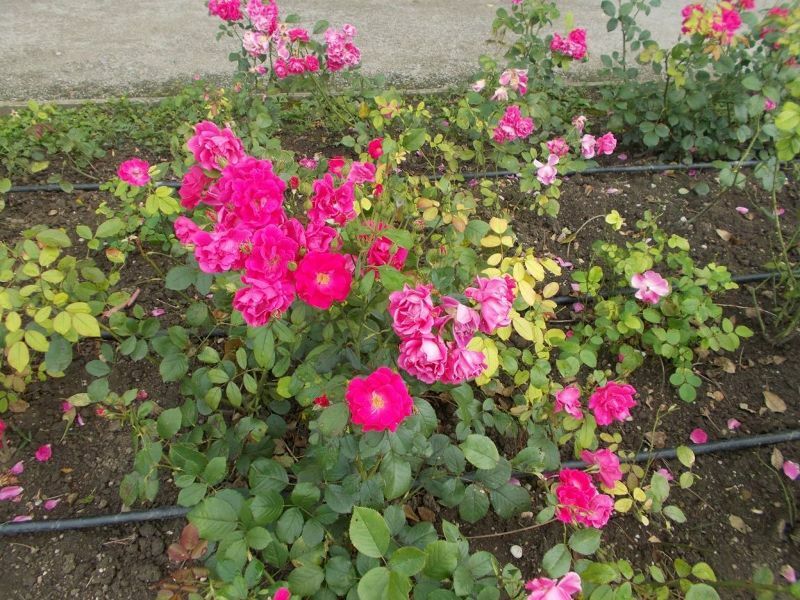 During its long history it has been damaged by fires, earthquake and a Tartar invasion. 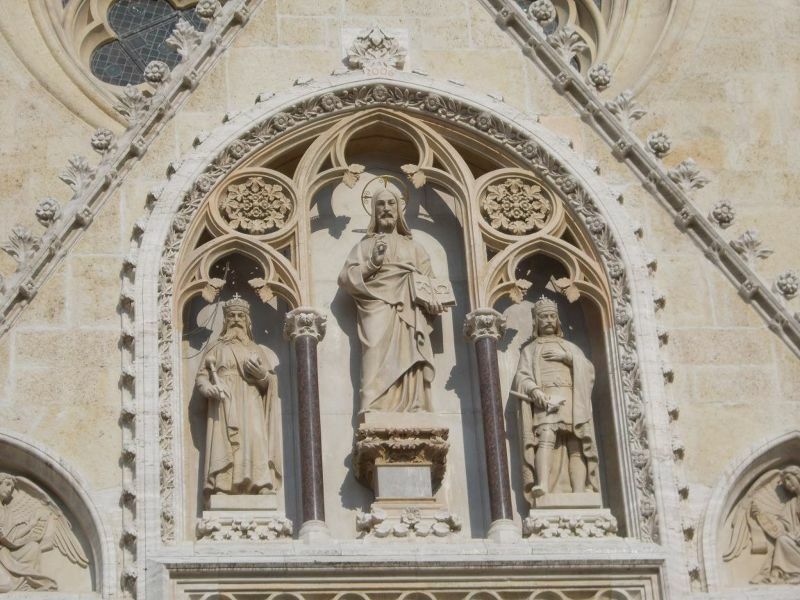 After Zagreb experienced a dreadful earthquake in 1880 the cathedral was restored by Hermann Bollé, Outside the cathedral there were two pillars: one restored and one not. At the end of the Communist era the whole cathedral was in the same state as the non-­restored pillar after years of neglect. 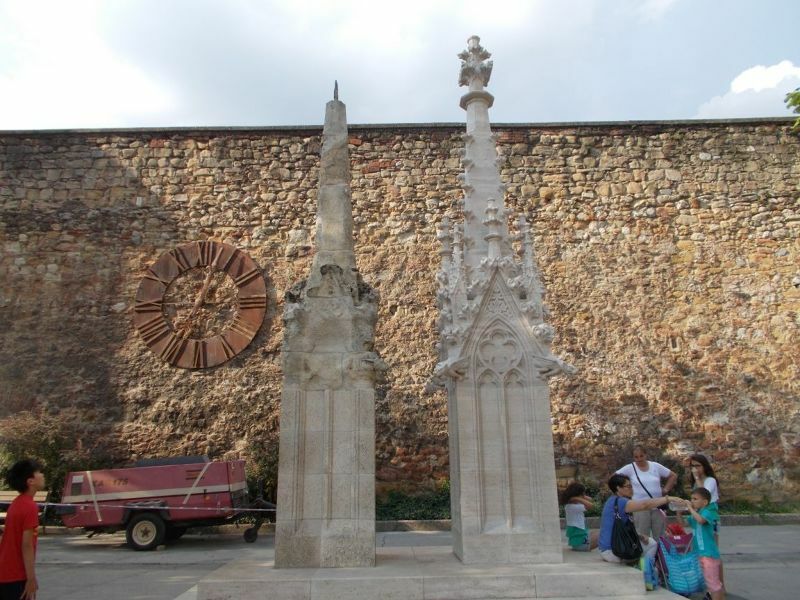 Nearby was a clock stopped at the time the earthquake of 1880 struck the city. During our visit there was a service going on inside the cathedral, so we could not wander round and look at things. Instead we listened to parts of the service. 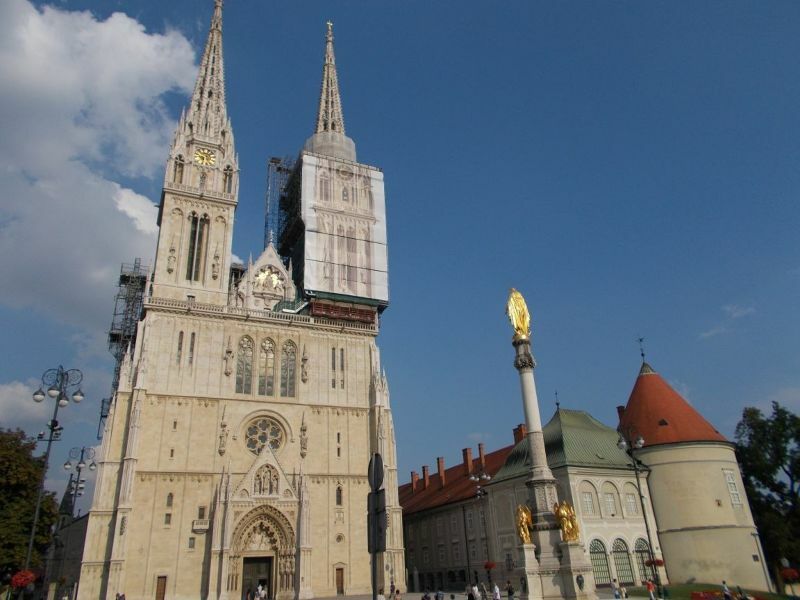 Zagreb Cathedral was visited by Pope Benedict XVI in 2011. 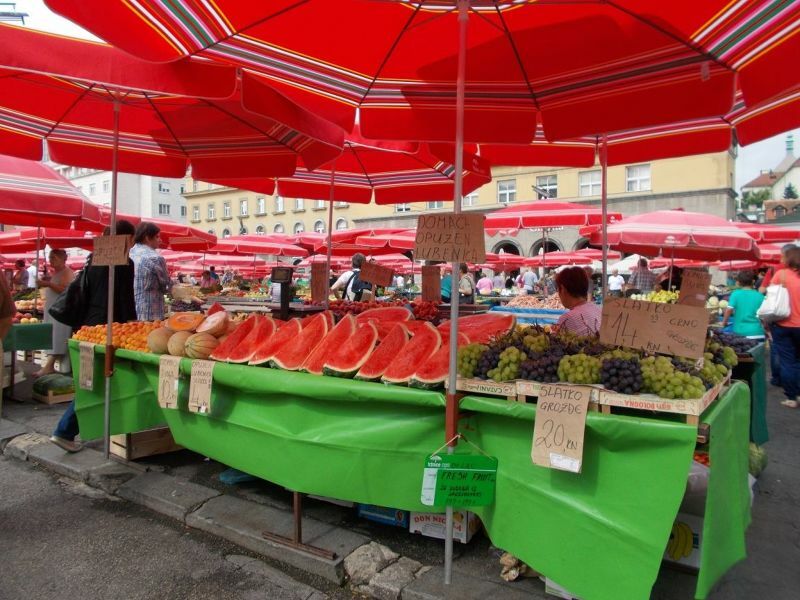 Dolac Market is also located in the Kaptol area. 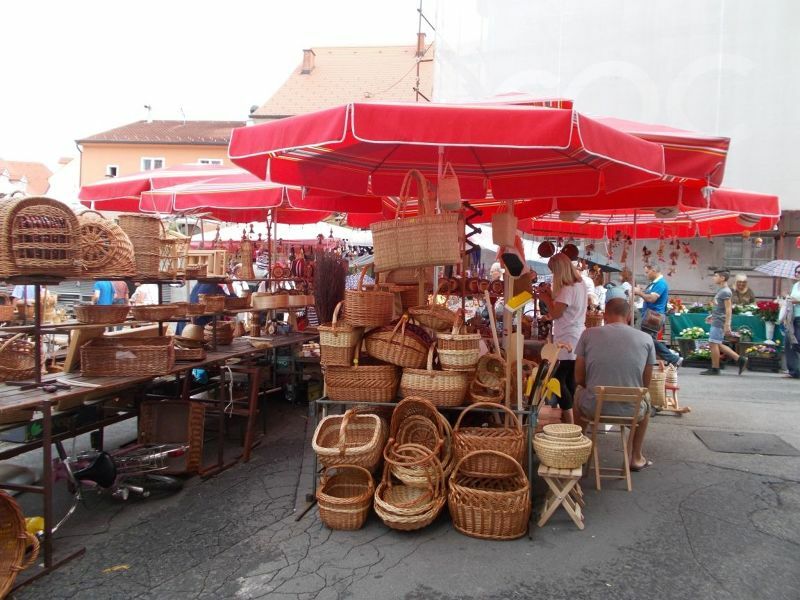 The market is a colourful assortment of stalls selling flowers, fruit, vegetables, baskets, wooden goods and souvenirs. 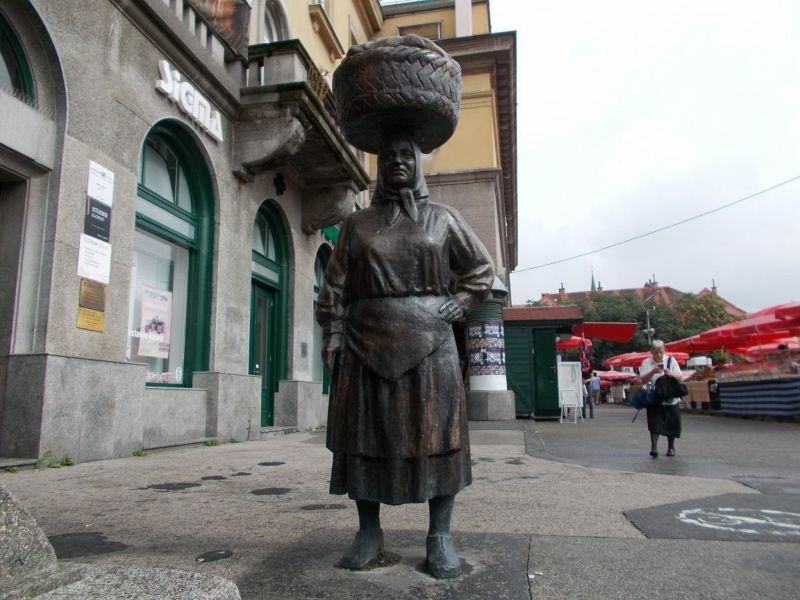 I liked the statue of the lady carrying a basket on her head as she set off to market. 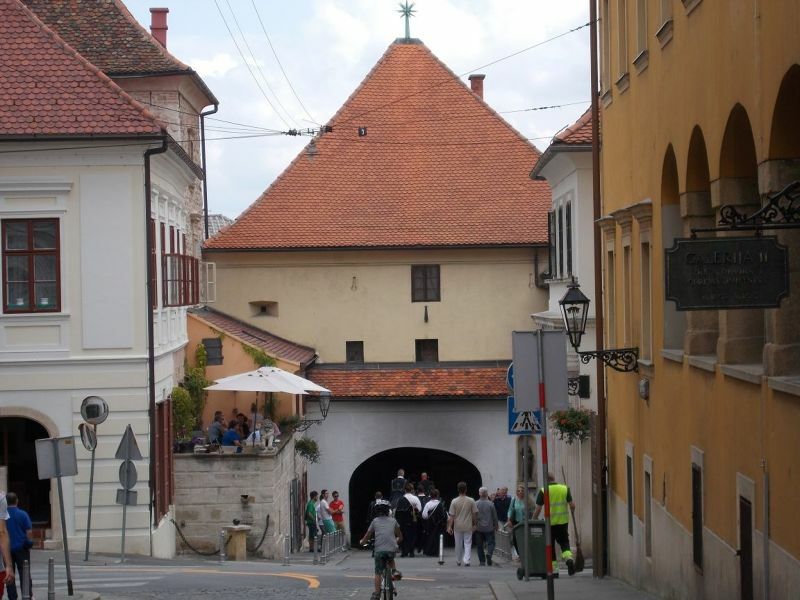 The Funicular up to Gornji Grad is supposedly the smallest funicular in the world. We did not use it and instead climbed up the stairs next to it. There were good views from the top. 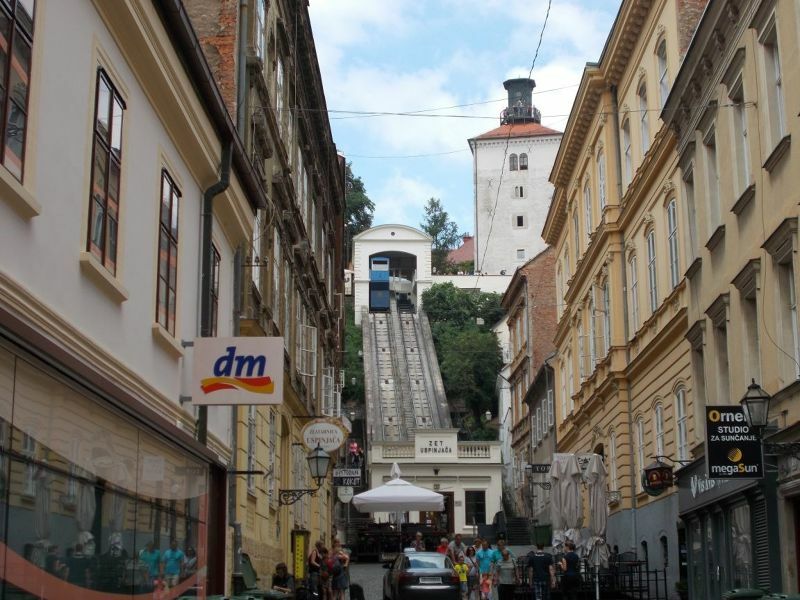 A ride on the funicular costs 5 kuna. 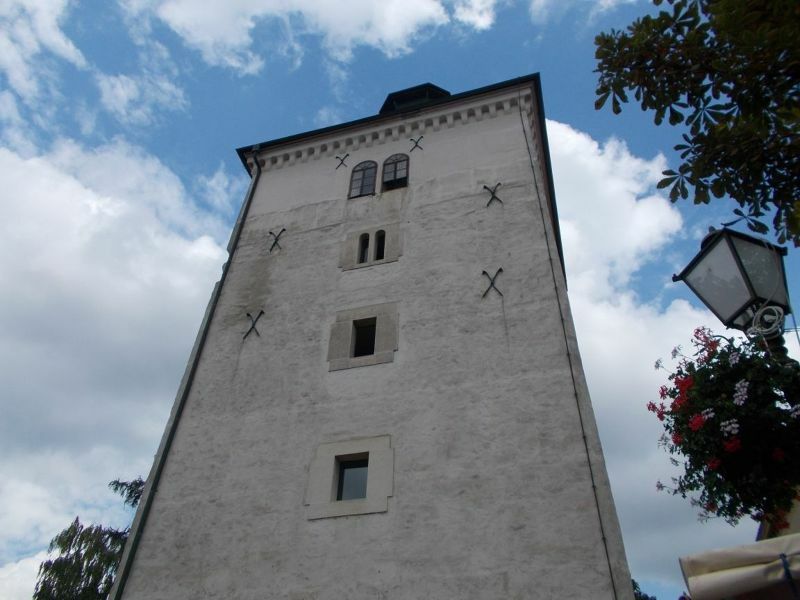 The Lotrscak Tower stands at the top of the funicular. You can go up it for views over Zagreb but we did not do so. This tower dates from 1266 and contains the Gric cannon which is fired daily at noon; just as it has been every day since 1877. 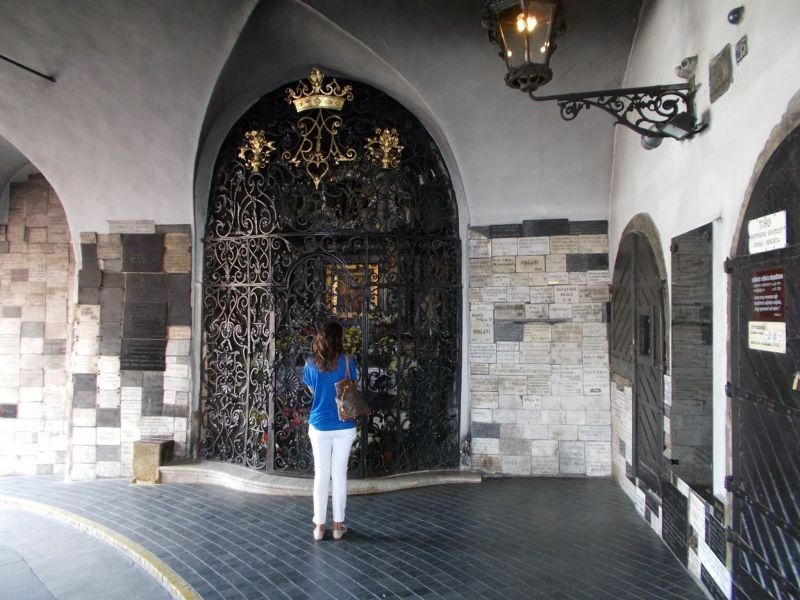 The tower is open from 9am to 9pm Monday to Friday and from 10am to 9pm Saturday and Sunday. 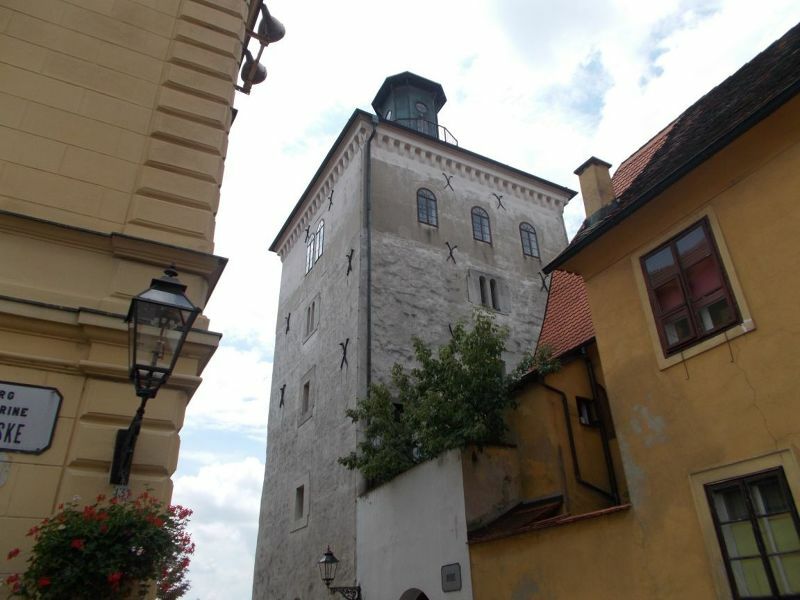 Different exhibitions are held inside the tower. The Church of St Catherine. 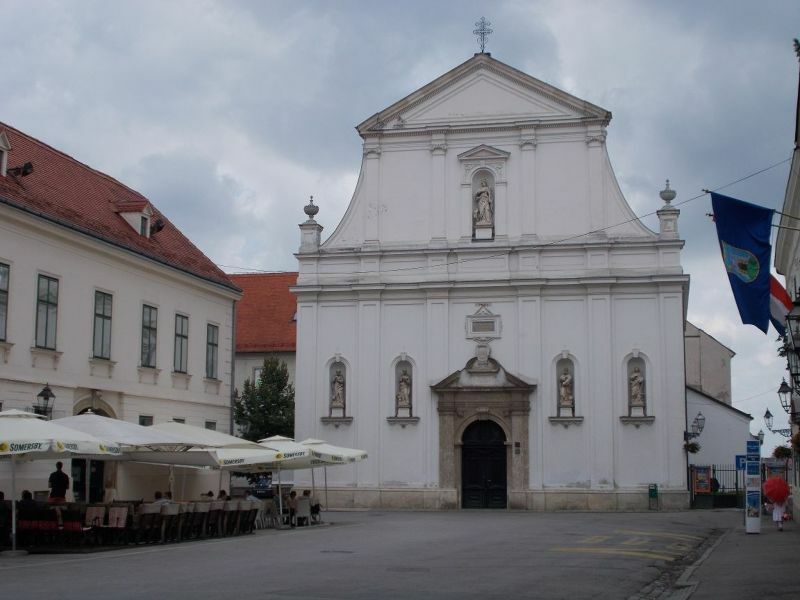 This church is located in Gornji Grad. 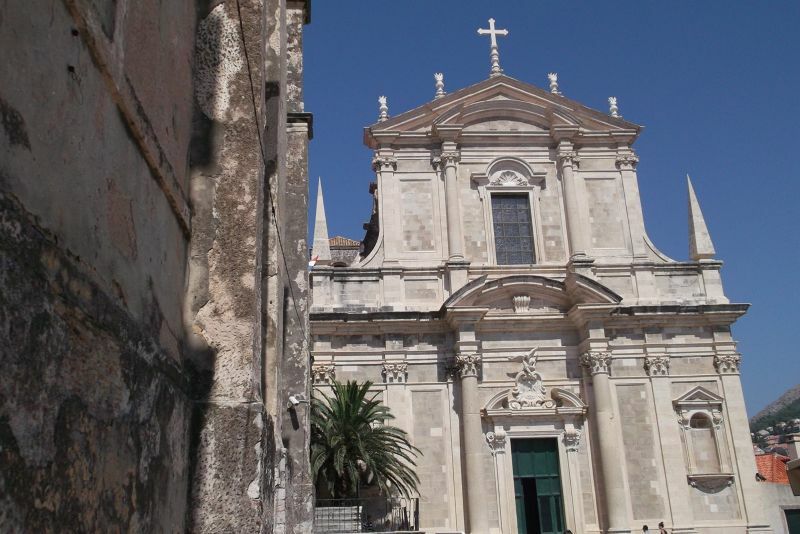 It is a baroque church and was originally built in the seventeenth century by the Jesuits. 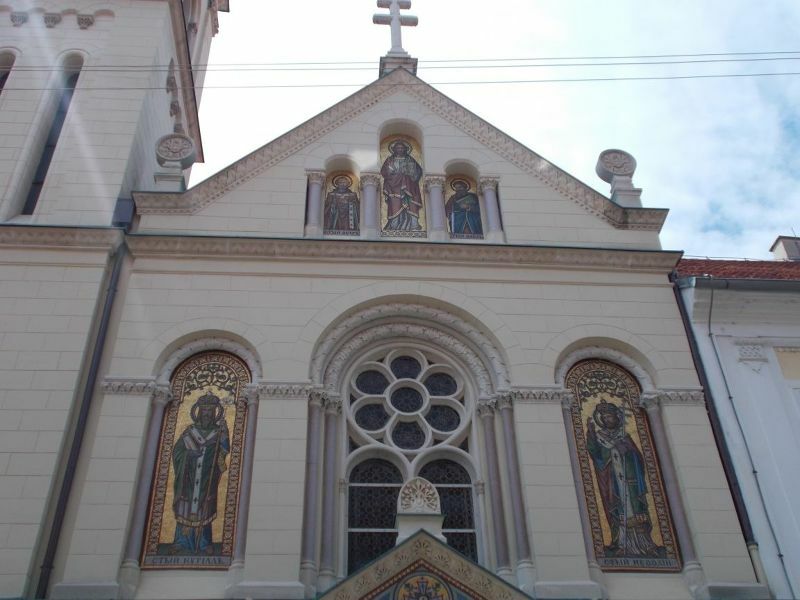 St Catherine’s was totally destroyed in the 1880 earthquake and was completely rebuilt by Zagreb architect Hermann Bollẽ;. It was closed during our visit. 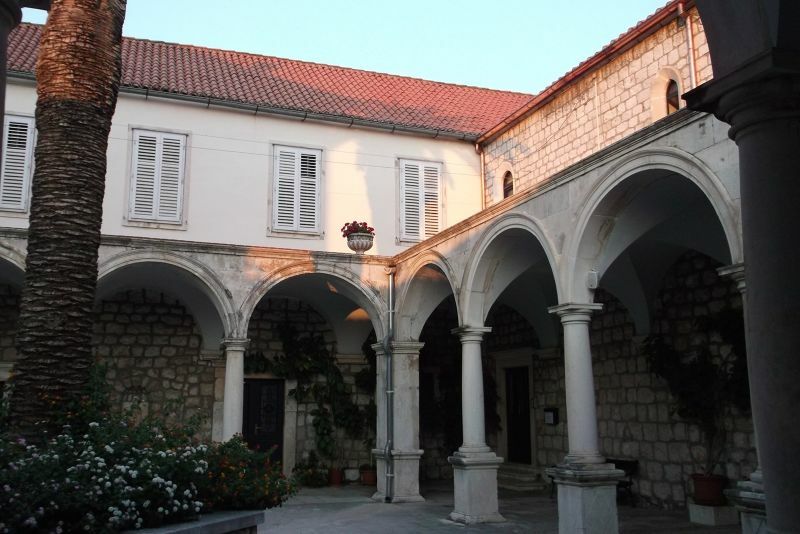 The Church of Cirila I Metoda. The Church of Cirila I Metoda was also closed when we visited, but we liked the colourful icons on its façade. 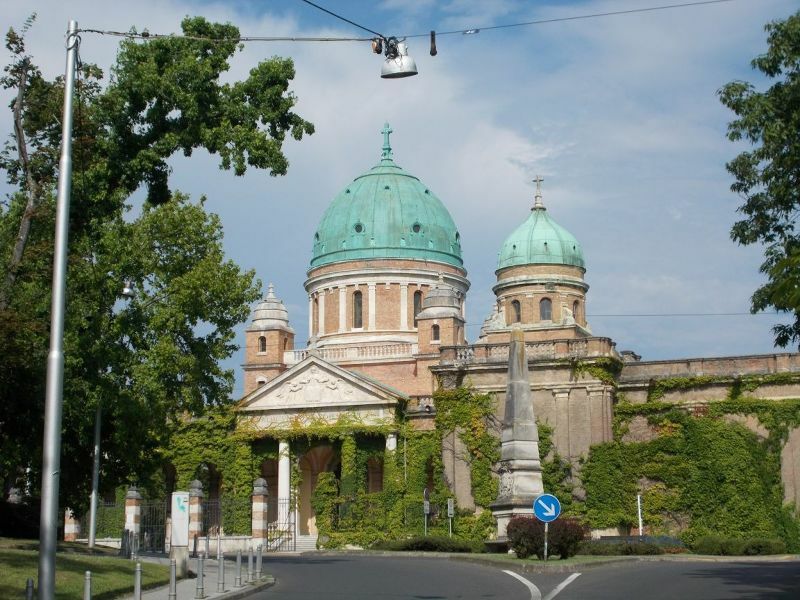 This church was built in 1880 by Zagreb architect, Hermann Bollé who was born in 1845 and died in 1926. This church dates from the fourteenth century. 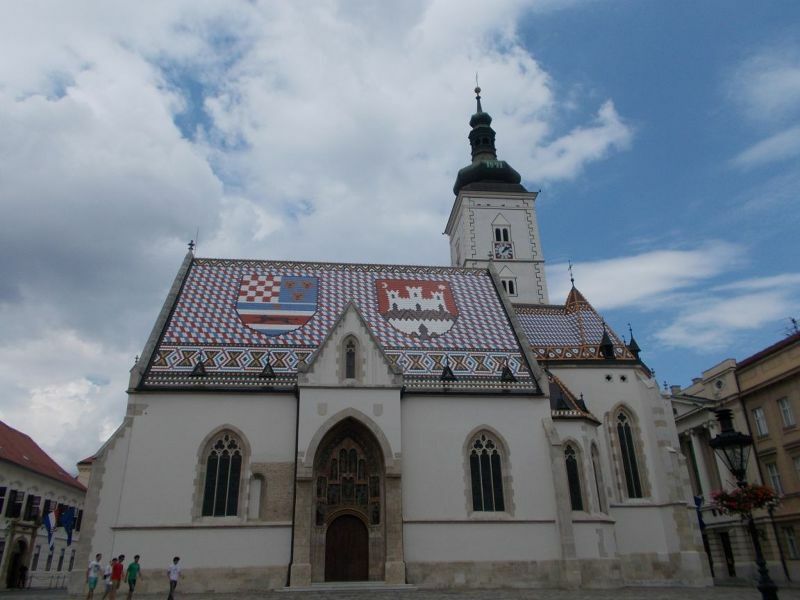 Its most notable feature is its colourful roof depicting the Croatian, Dalmatian and Slavonian coats of arms. 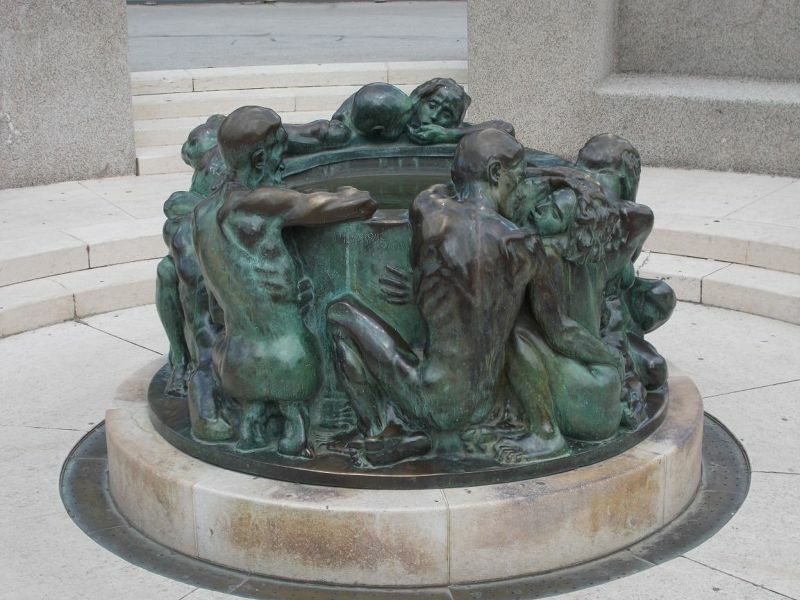 Inside there are sculptures by Ivan Mestrovic, Croatia’s most famous sculptor. As the church was closed during our visit we did not see these. On the same square as the church sit the parliament and presidential palace. 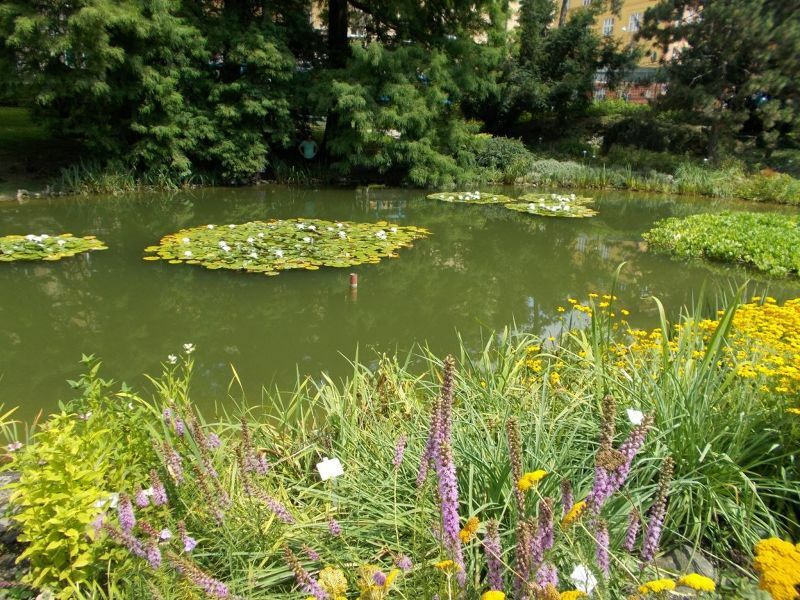 These beautiful gardens form part of Zagreb's green horseshoe area. 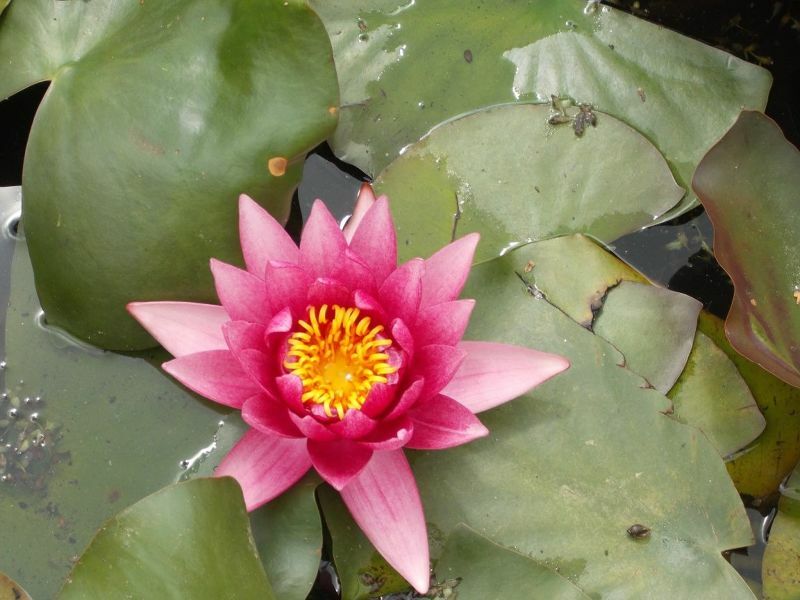 They are free entry and have beautiful turtle filled ponds and beautiful water­lily filled ponds. 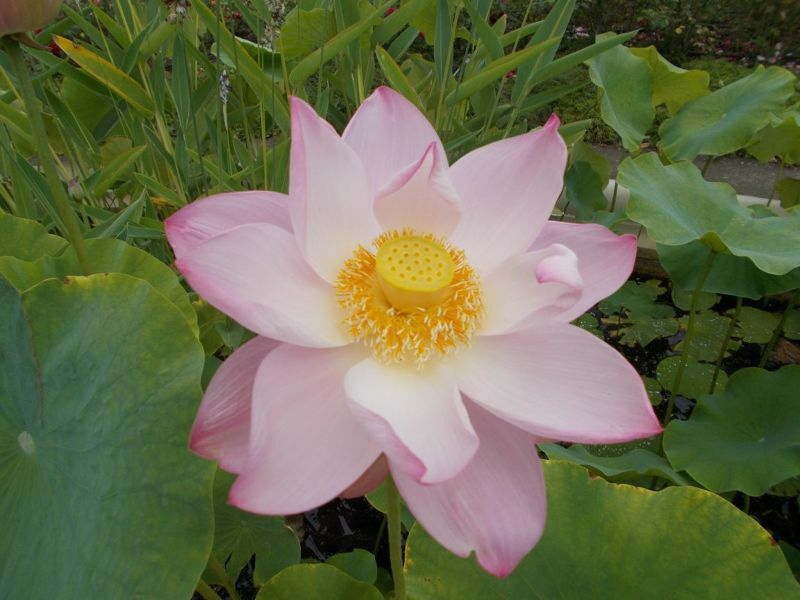 I love plants and thought the gardens were a lovely, peaceful place for a seat or a stroll. 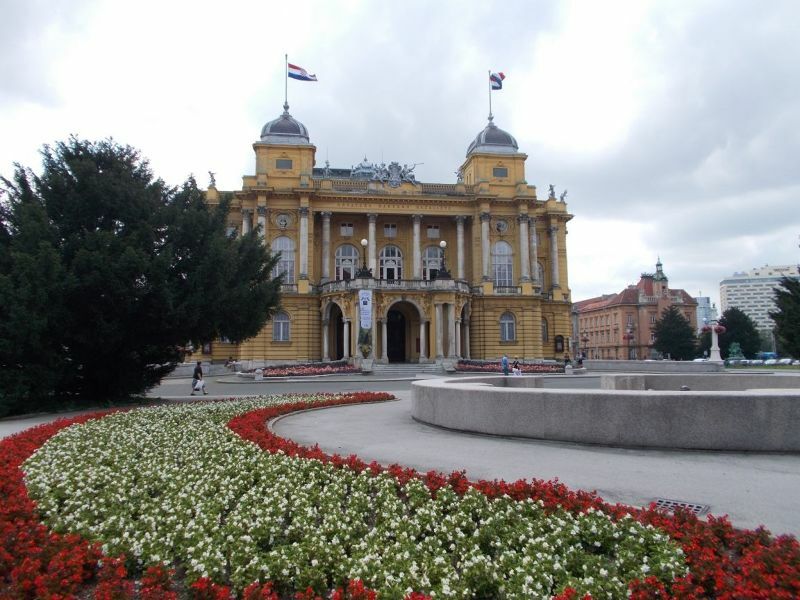 Zagreb is a city with lots of greenery even right in the city centre. 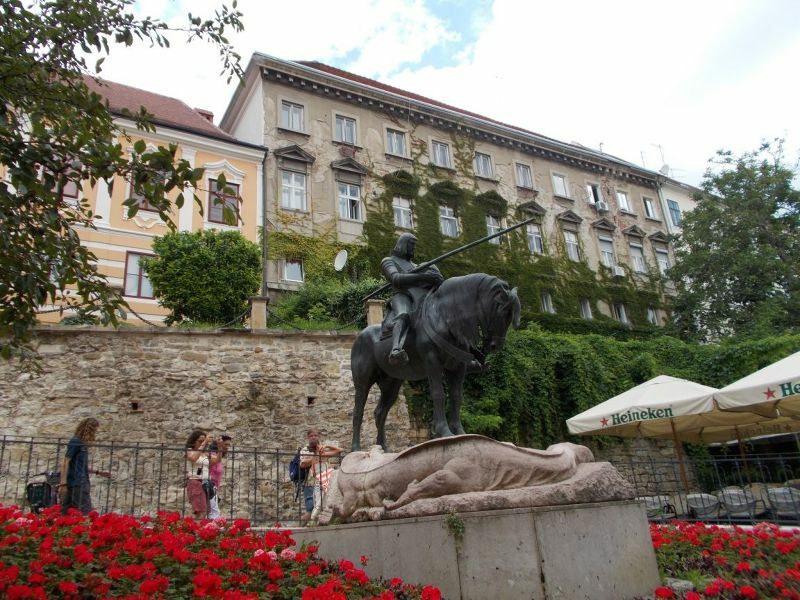 One prong of the so called green horseshoe stretches from Zagreb Railway Station past the Trg Kralji Tomislava, the art pavillion, the Trg JJ Strossmayera to the Trg Nikole Subica Zrinskog. 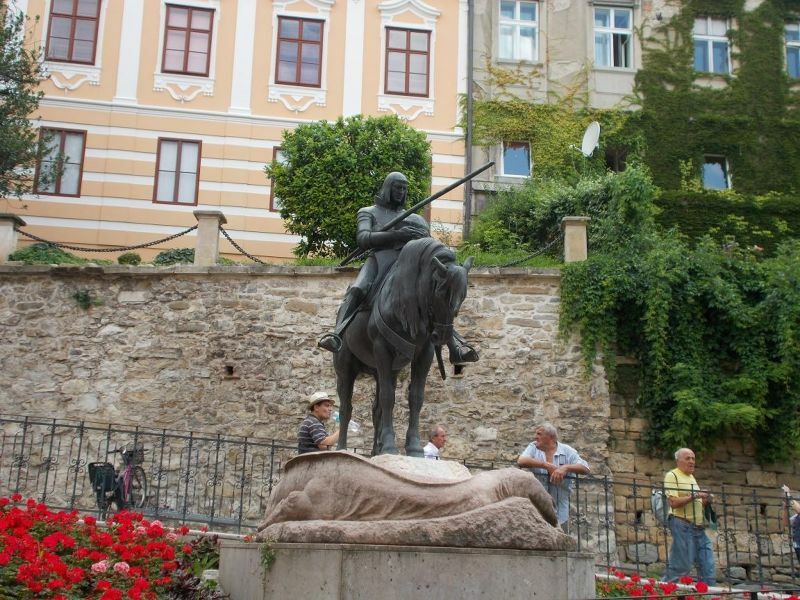 Near the railway station there is a statue of King Tomislava sitting on his horse. The art pavillion is a very attractive bright yellow building. This area also has statues and fountains. There are plenty of seats here to relax on in the shade. Both sides of this green area are lined with beautiful buildings with ornate facades. The Green Horseshoe Prong Two. 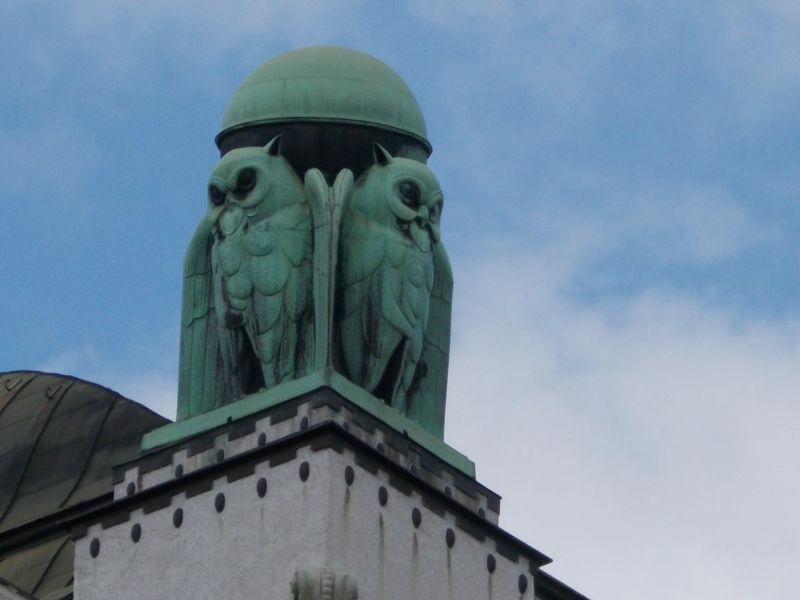 The other prong of the green horseshoe stretches from the state archives - ­ a beautiful building with owls on its roof. 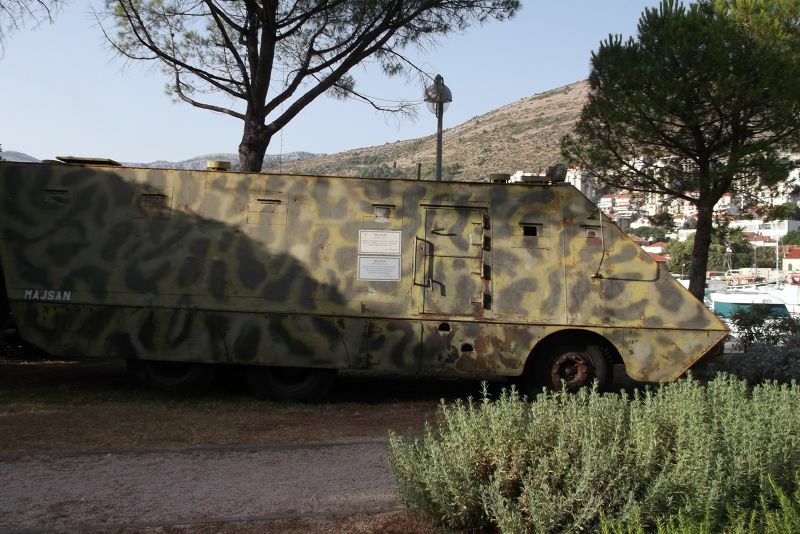 This is on Trg Marka Marulica. 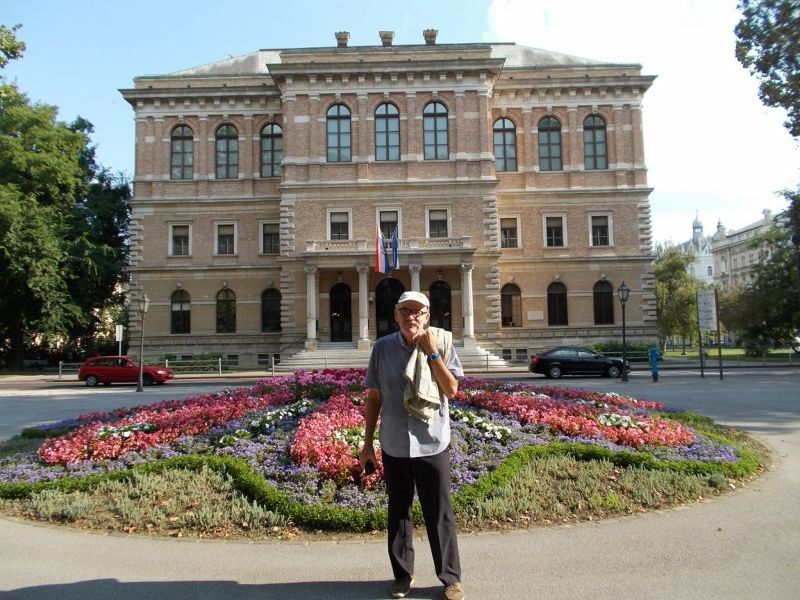 The green area also covers Trg Antuna, Ivana i Vladimir Mazranica and Trg Marsala Tita with its lovely Croatian National Theatre. 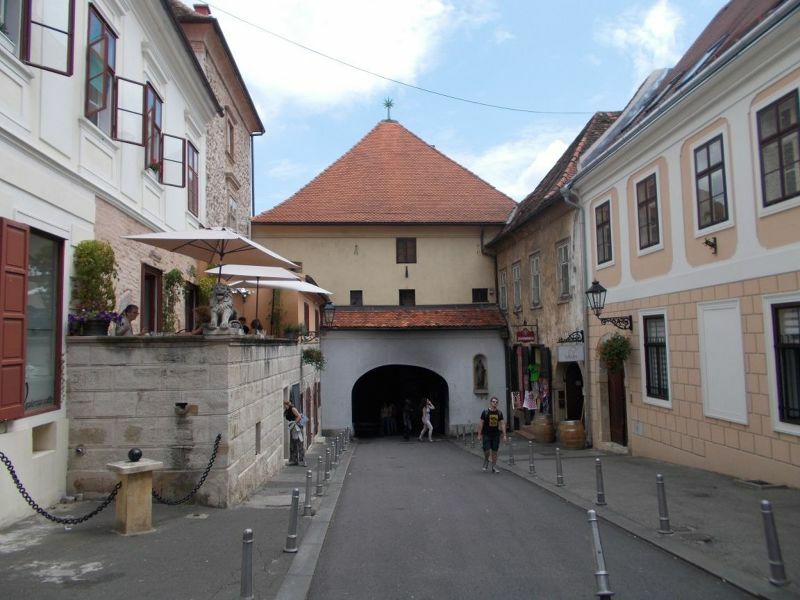 The Stone Gate is near St Mark's Church in Gornji Gradec. In 1731 a great fire destroyed most of the gate but a painting of the Virgin and Child by an unknown 17th century artist inside the gate survived. The painting is part of a shrine inside the gate nowadays and many people come here to pray and place flowers. Praying at the Virgin and Child Shrine. 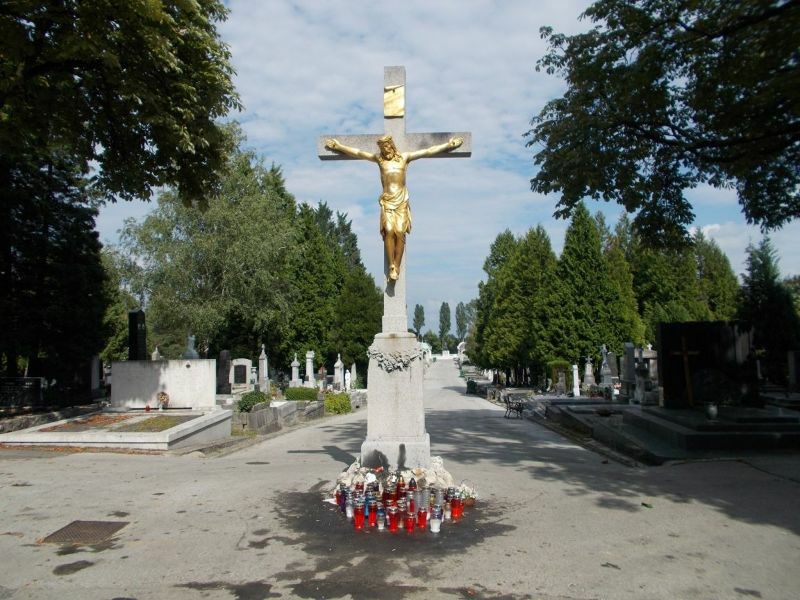 We walked to Mirogoj Cemetery from the old town. It was quite a long way and took around 35 to 40 minutes. You can also get here by bus. The cemetery is surrounded by domed walls covered with green ivy. 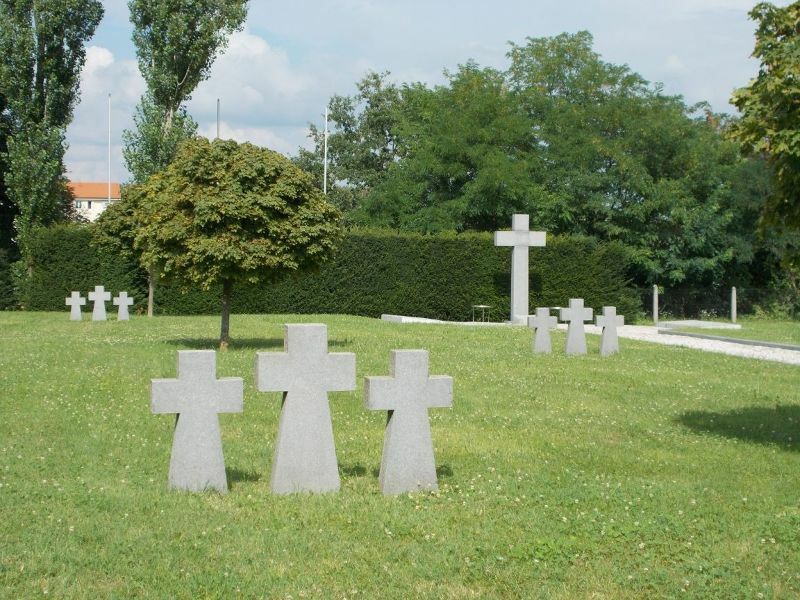 It is a very well kept cemetery in excellent condition and an interesting place for a stroll. Outside the entrance there are shops selling flowers and candles. I found the war areas at the bottom of the cemetery particularly interesting. 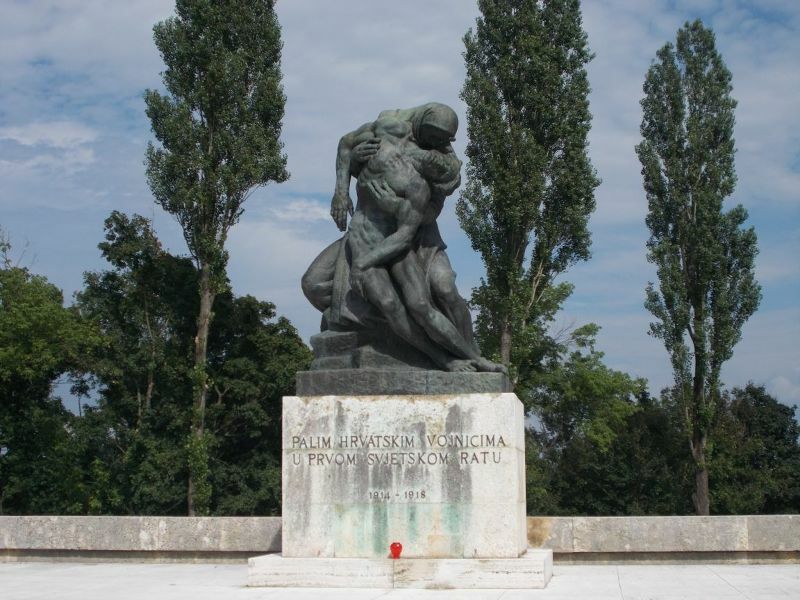 There was a sculpture on top of a mass grave of victims of World War I and an area of white crosses for the dead of World War II. 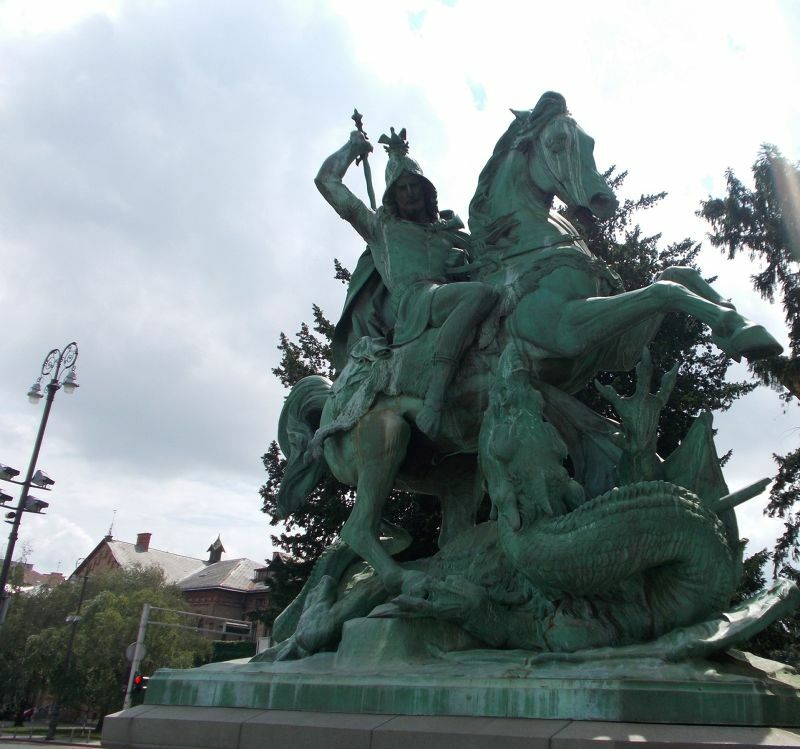 We found one St George and the Dragon Statue near the Croatian National Theatre and another one outside the stone gate in the old town. 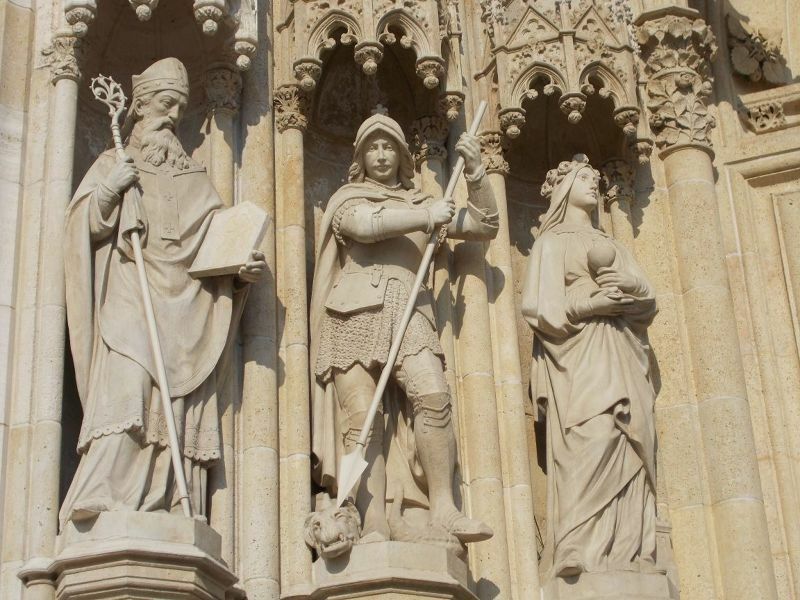 Both were well worth seeing and very good to take photographs of. 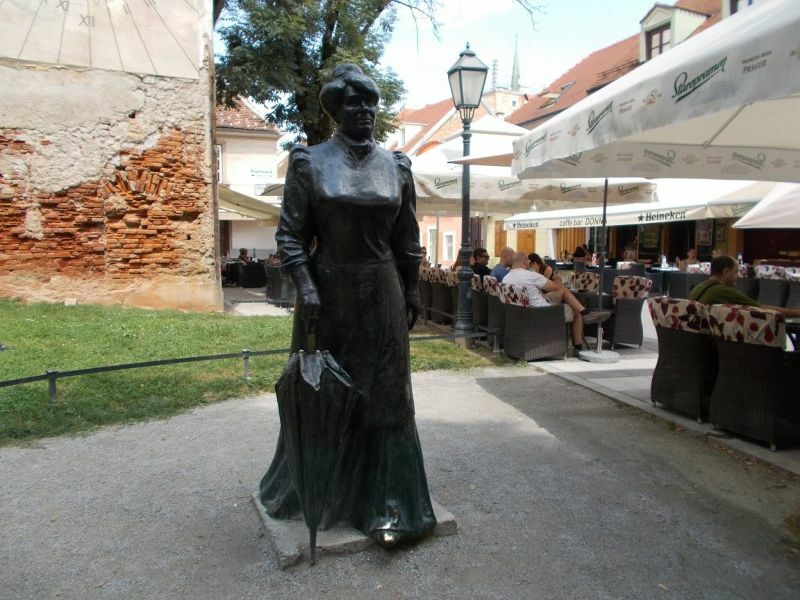 Statue Of Marija Juric Zagorka. 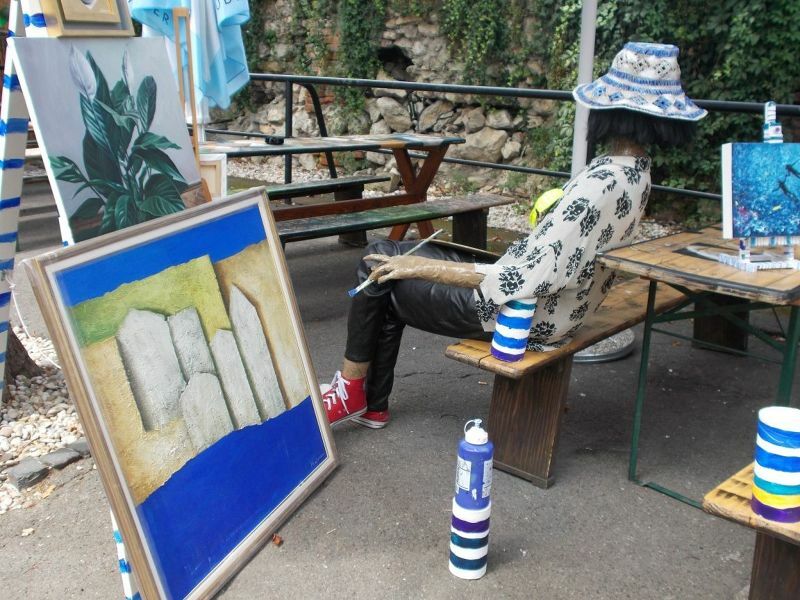 On Tkalciceva in Kaptol we noticed a statue of a prim looking lady holding an umbrella. All around her were bars and cafes. 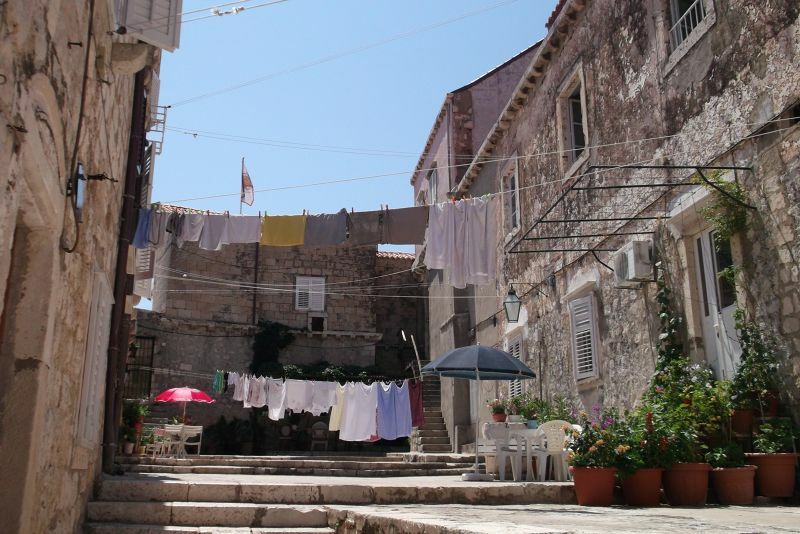 To us she looked rather like Mary Poppins, but, in fact, she was Marija Juric Zagorka ­ Croatia’s first female journalist. Marija Juric Zagorka was also an author and wrote nineteen novels. In addition to that Marija Juric Zagorka was the founder of Women’s Papers, the Austro­Hungarian Empire's first ever magazine which focused on women’s issues. 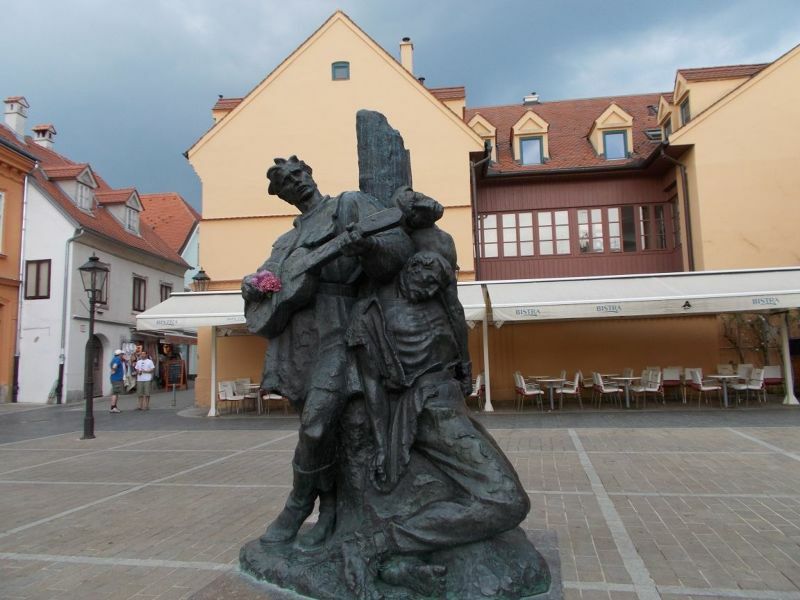 Statue Near Market Place Zagreb. 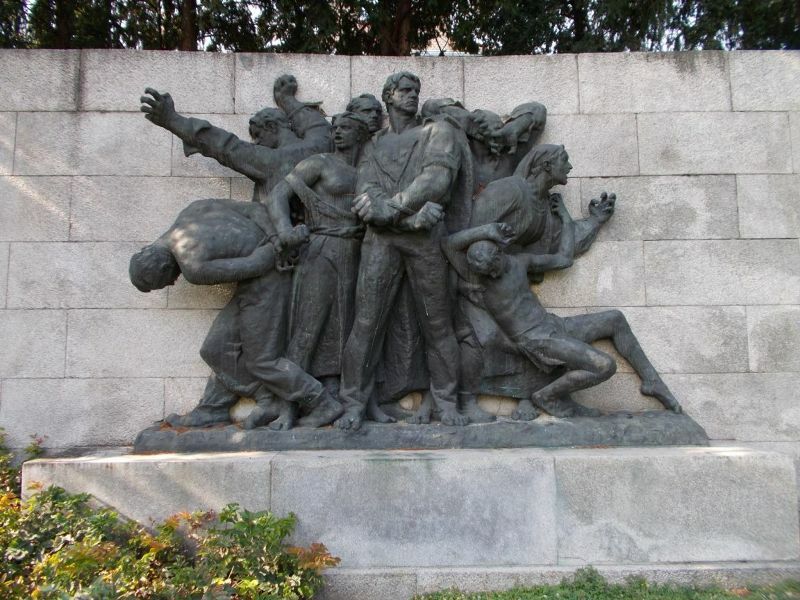 I found this statue near the market place in Zagreb, but I am not sure what it depicts. Two of the men in it are prisoners and look injured or dying, one is playing a musical instrument.. I wrote the above part of this tip when I had extremely limited internet access. 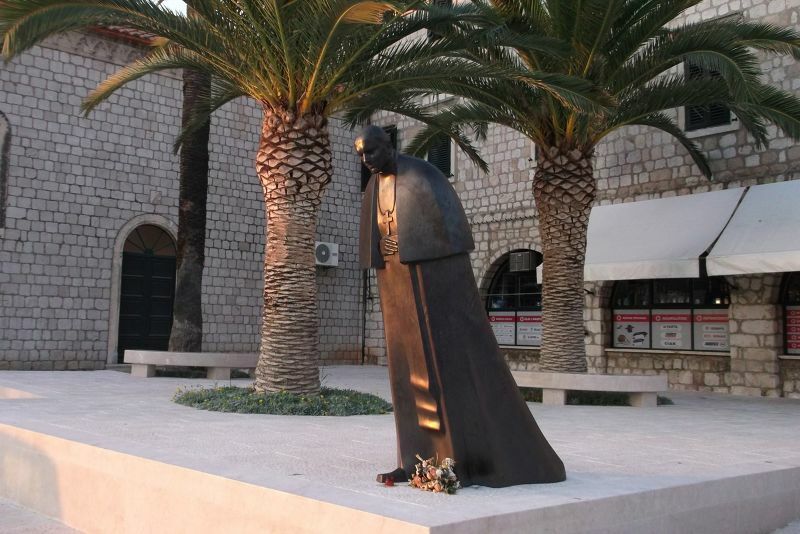 I now know the statue is of Petrica Kerempuh. He is a fictional character who is known for his extremely unconventional sense of humour. He travels the world and laughs at people suffering adversity. His role is not so much a sadistic one but a way to teach people that humour is a means of getting through adversity. 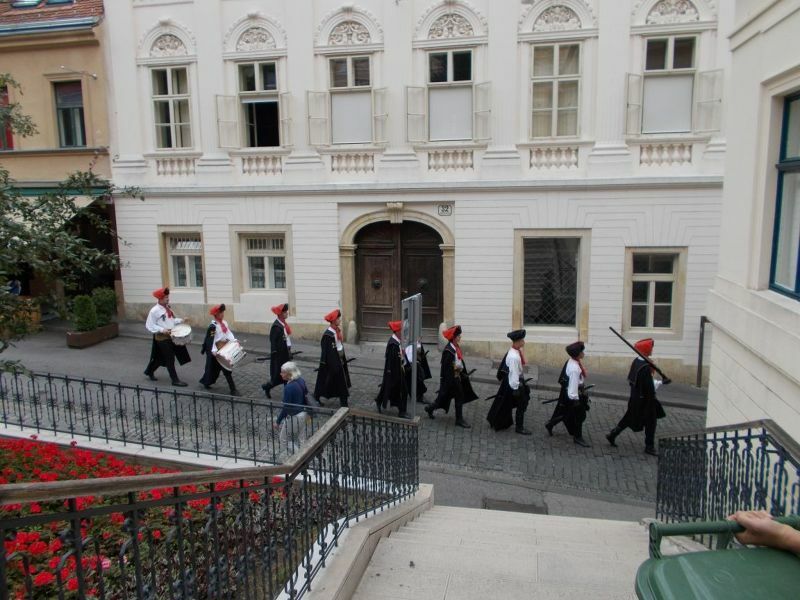 There are various ceremonies on Saturdays and Sundays in the old town revolving around the changing of the guards. They start at noon and continue in various parts of town until about two. We caught up with them just as they were leaving St Mark's Church. 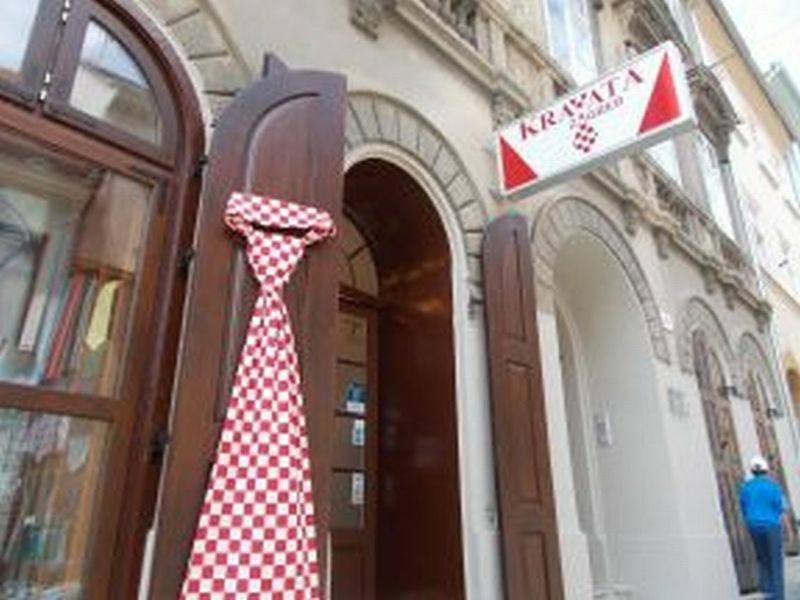 The term cravat derives from the French word for a Croat person. Croatian mercenaries in France wore brightly coloured scarves as part of their military uniforms. The soldiers in the changing of the guards ceremony wore colourful cravats. 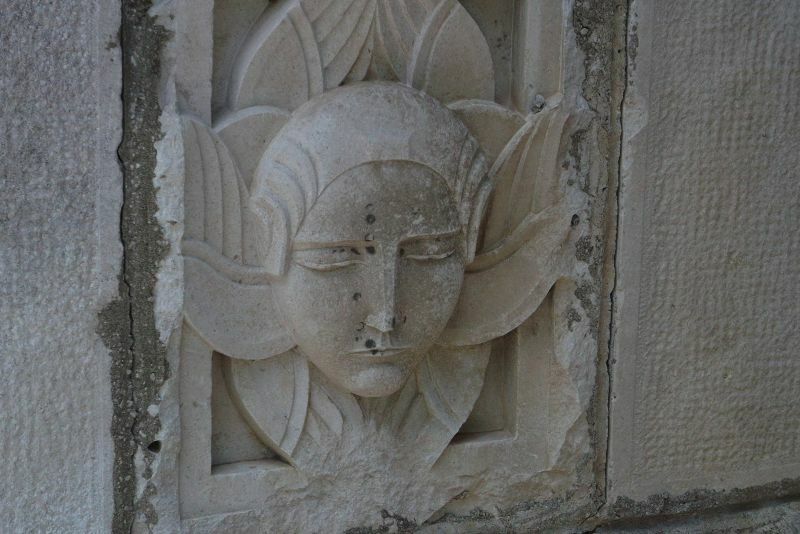 I love carved faces on buildings and monuments etc. Here are two of my favourites from our trip to Zagreb. 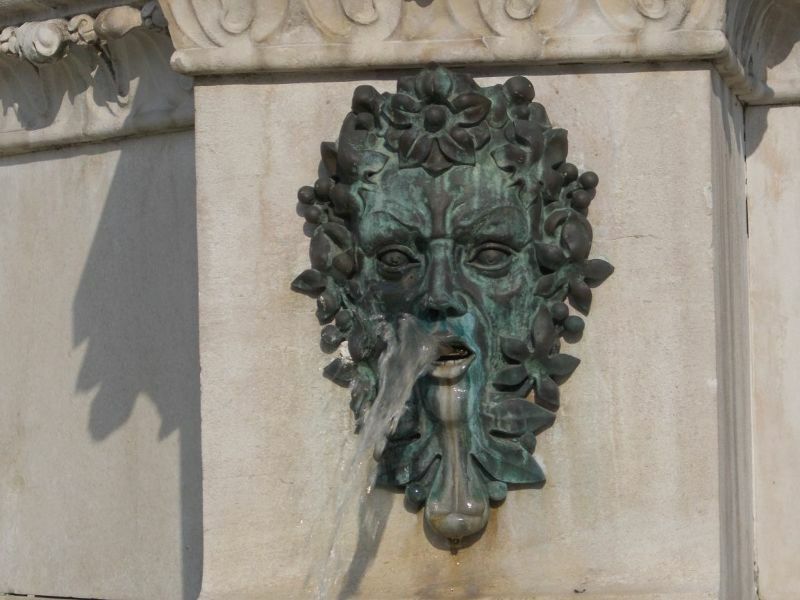 One is from a building near the botanic gardens and one is from the fountain in front of the cathedral. 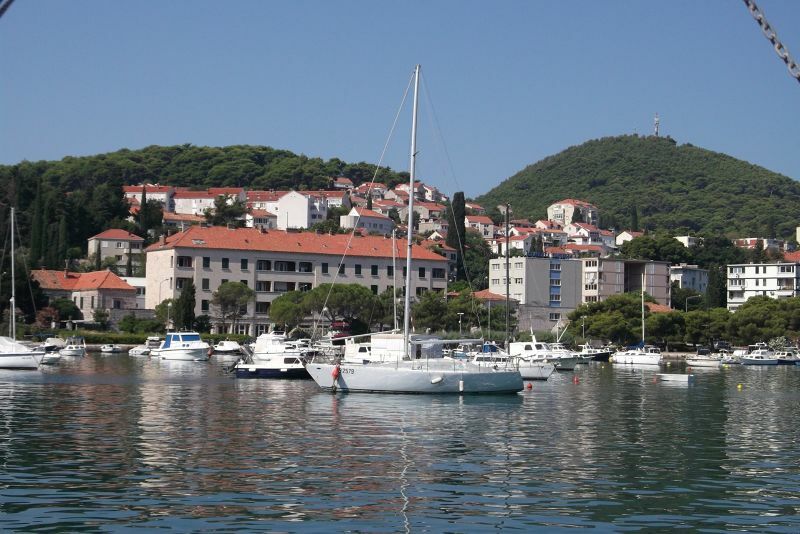 Lovely town on the Adriatic Sea. 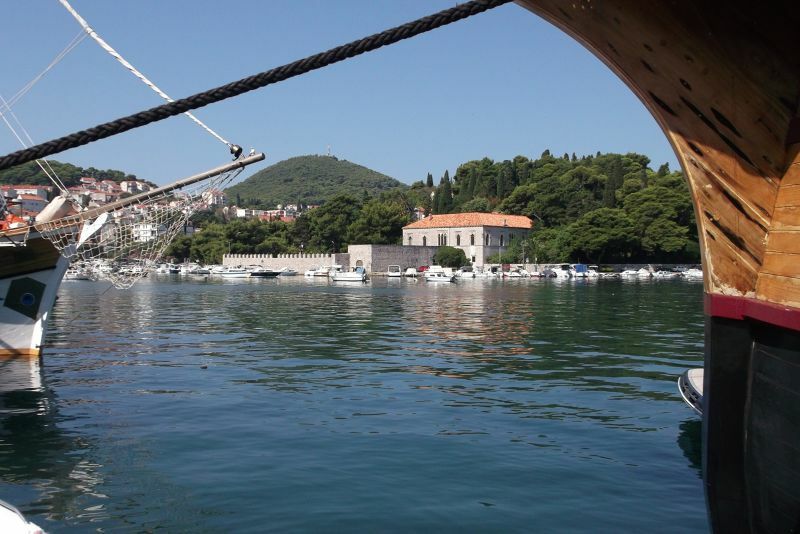 A Day Trip to Cavtat. 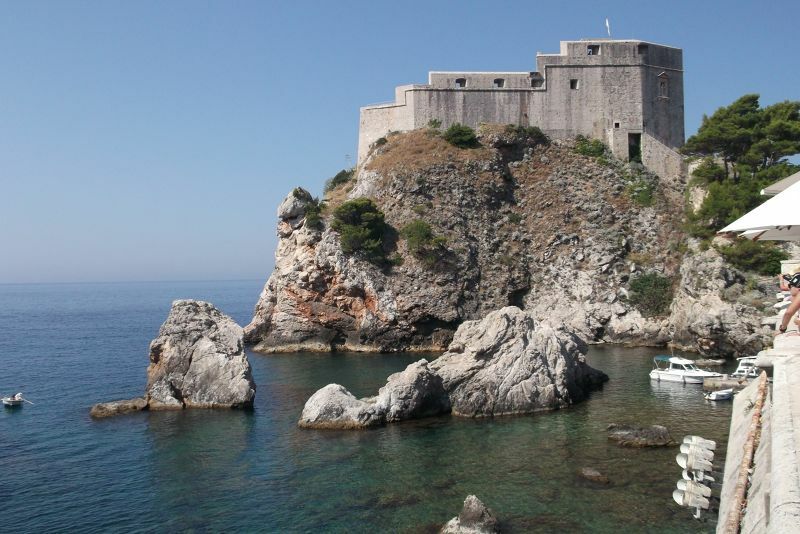 During our stay in Dubrovnik we also decided to do a day trip to Cavtat. 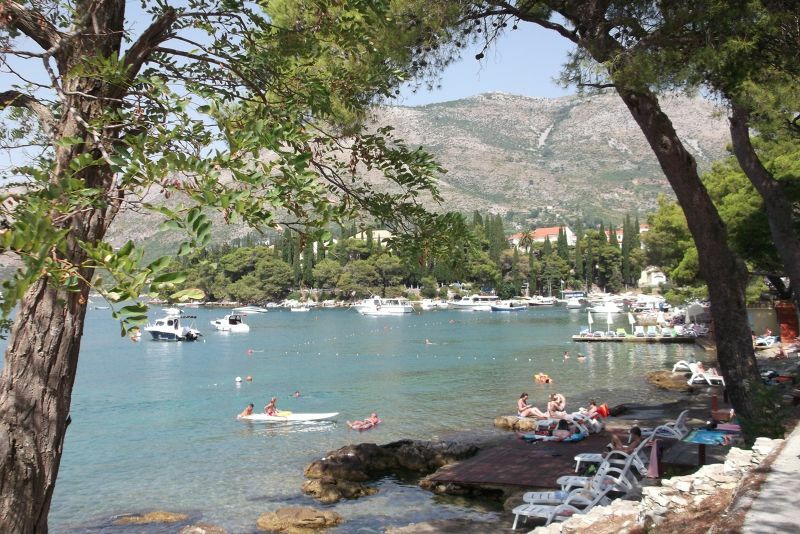 Cavtat is a beautiful resort area close to Dubrovnik. 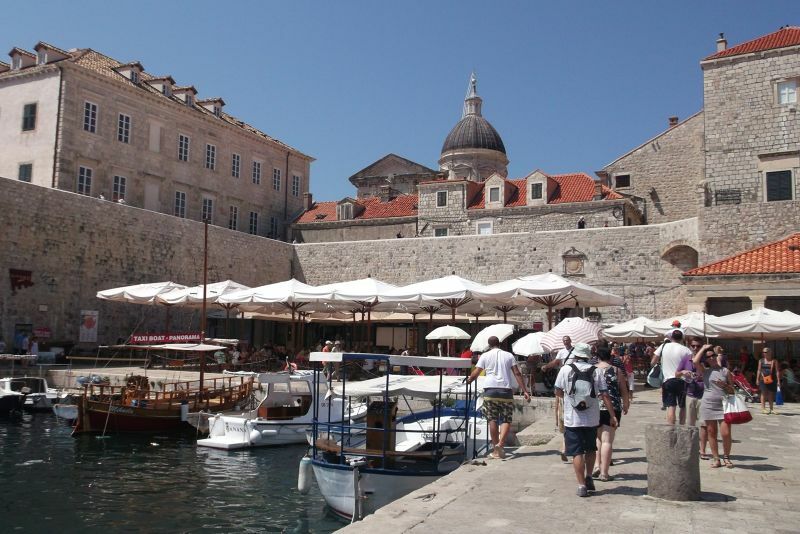 To get to Cavtat from Dubrovnik we took the number 10 bus from Gruz Bus Station. It cost 20 kunas; buy your ticket from the driver, no need to stamp it on the bus. 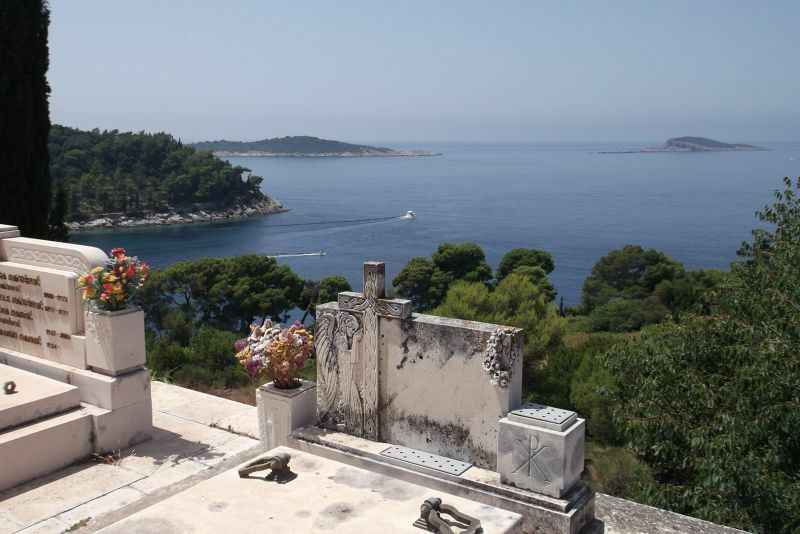 Cavtat has two lovely churches, several beaches and other lovely places to swim, lots of restaurants, an information centre and a scenic cemetery with a view. 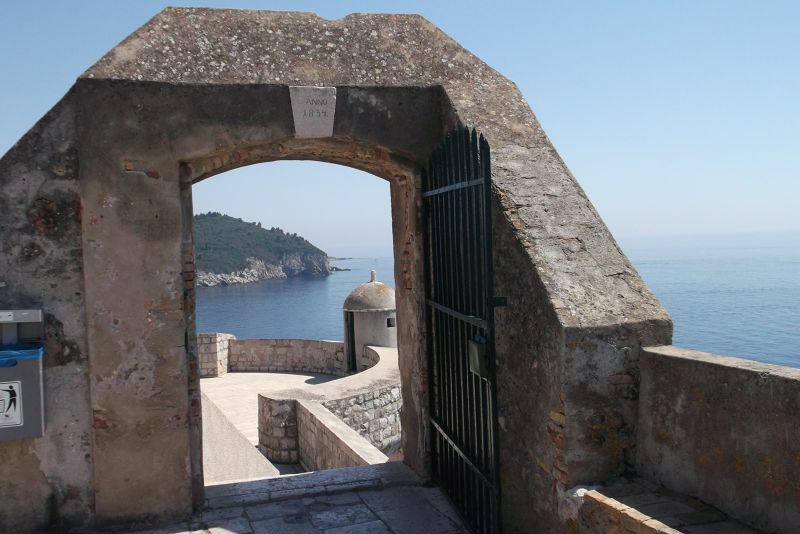 The journey to Cavtat from Dubrovnik is very pretty with great views over Dubrovnik Old Town and wonderful views over the coastline. Cavtat is a pretty and relaxing place to pass a few hours. 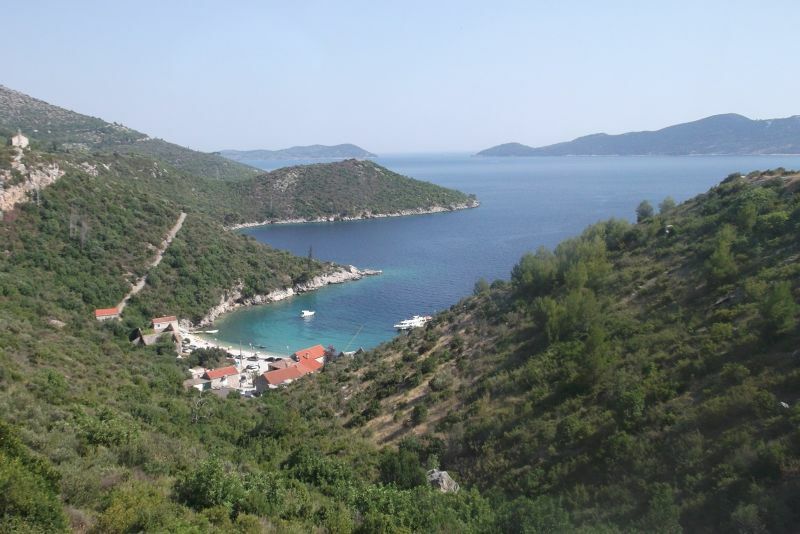 The sea in Cavtat is clean and clear to swim in. There are many places to swim. 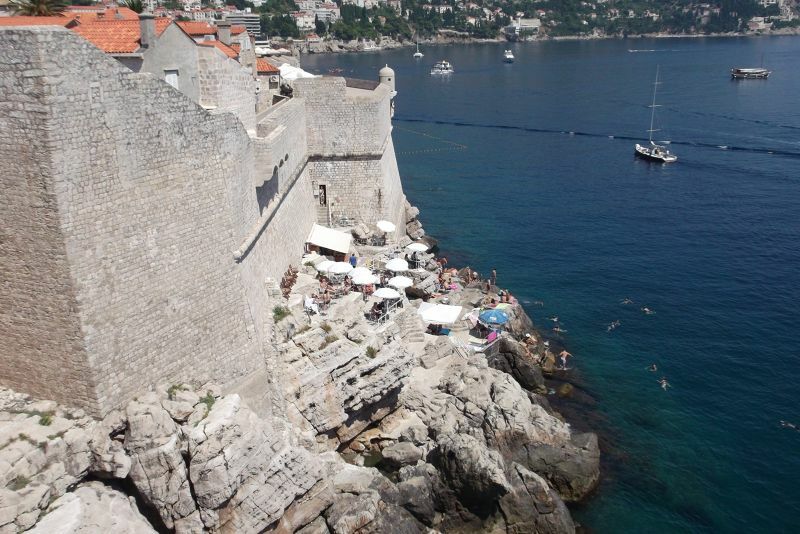 You can swim from a concrete slab beach where you can hire a lounger and umbrella or just off the rocky edge. The water is beautiful. Getting in involves clambering over stones and avoiding sea urchins. Sea urchins are not too hard to avoid as the water is so clear you can easily spot them. 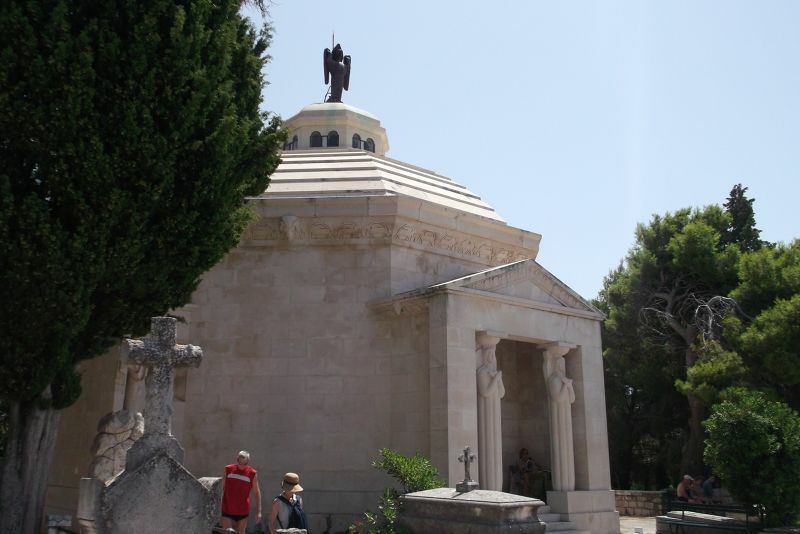 Cavtat: Cemetery. 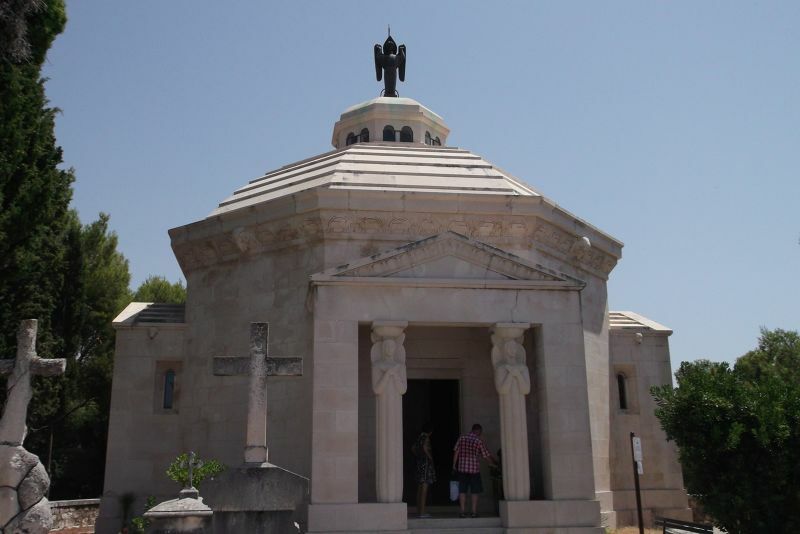 Cemetery And Mausoleum Of The Racic Family. 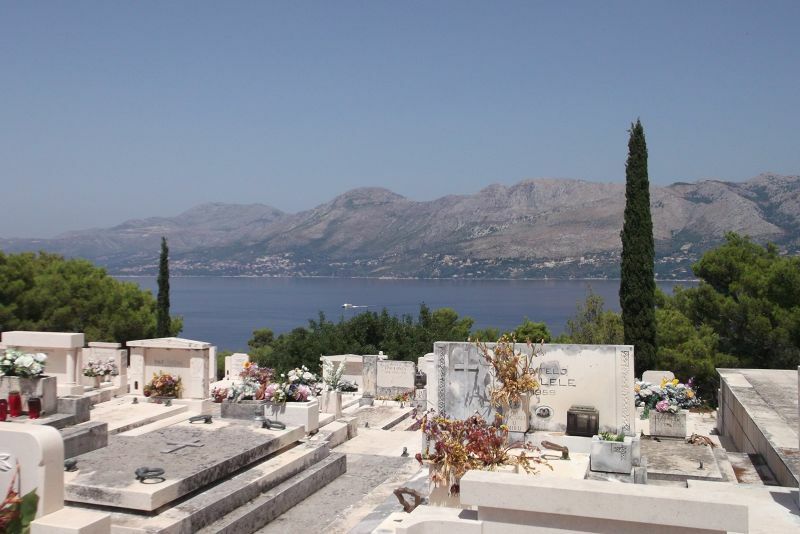 I followed signs for the mausoleum of the Racic family and ended up in a beautiful hilltop cemetery with spectacular views. The Racic family seem to have been a family of ship builders. That is as much as I could find out about them. A visit here for the views alone is well worth it. Battazar Baldo Bogisic (1834 -1908). 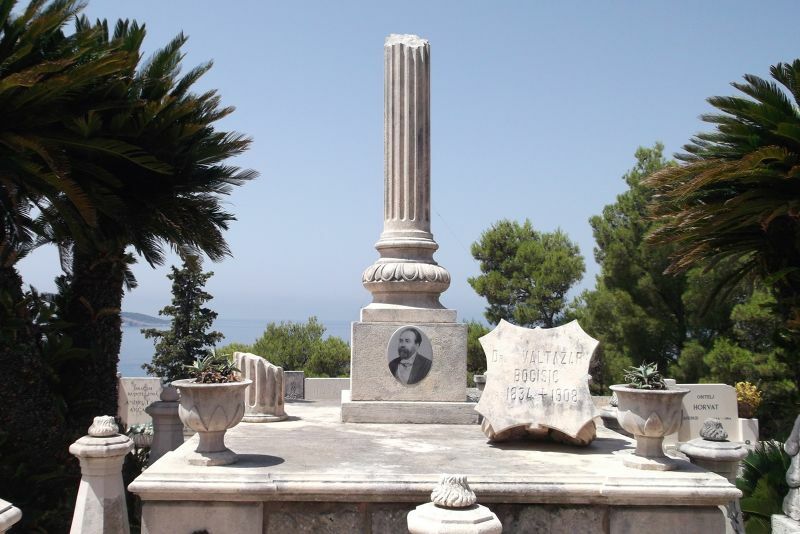 As we wandered around Cavtat we encountered a statue of Baltazar Baldo Bogišic (1834 - 1908) and later in the scenic hilltop cemetery we found his grave. 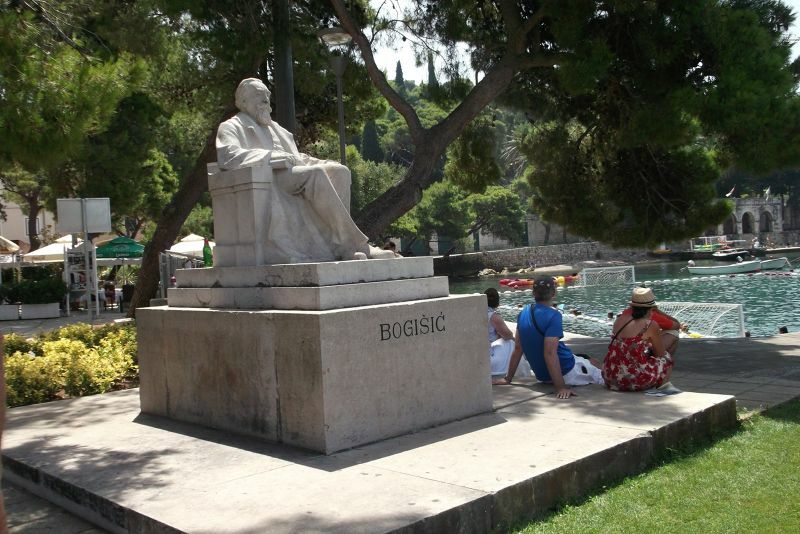 Baltazar Baldo Bogišic was a scientist and a member of many intellectual societies.He was born in Cavtat on December 7th 1834. 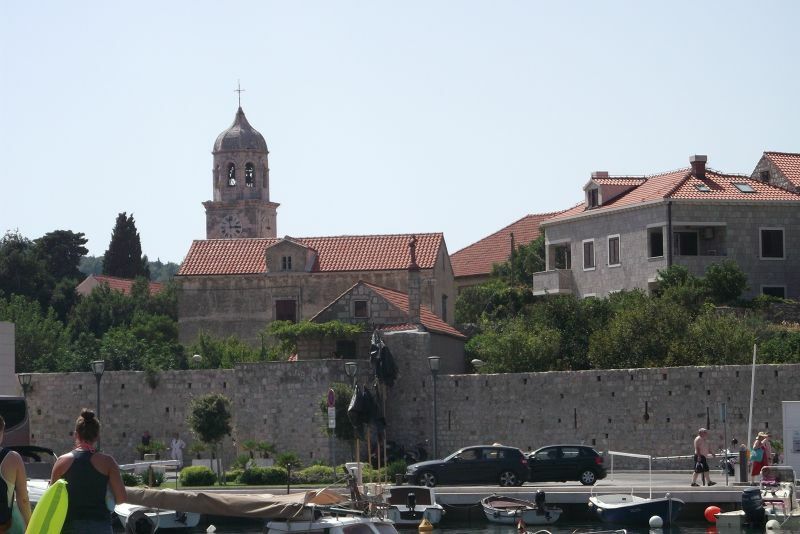 In Cavtat we visited a couple of lovely churches. 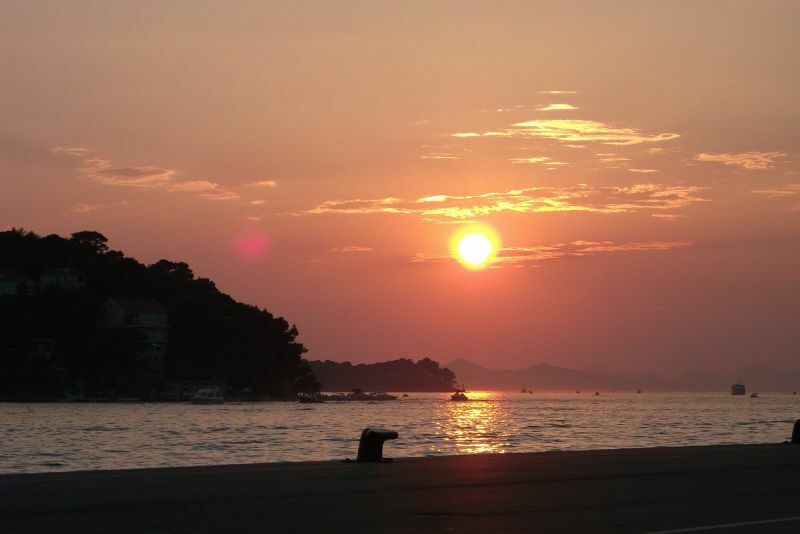 Some are located on the waterfront, others in the centre of Cavtat. 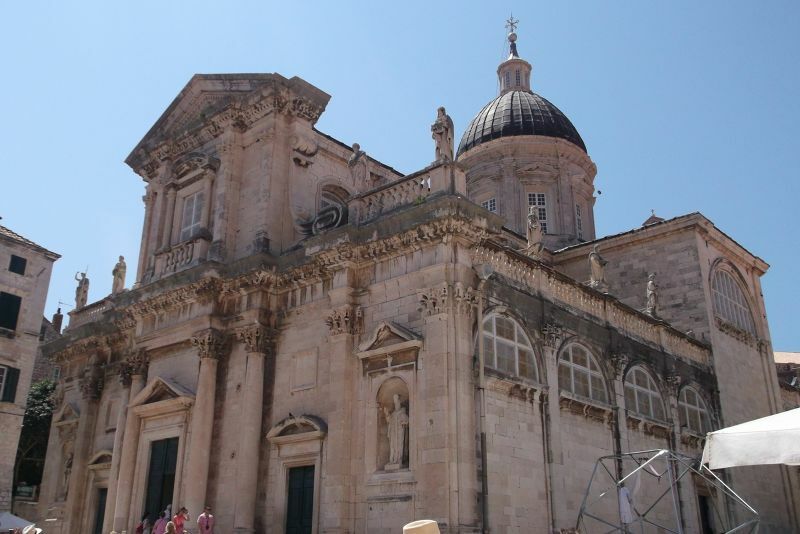 Croatia is a Catholic country and has many lovely places of worship. We love to look inside religious buildings when we get the chance. 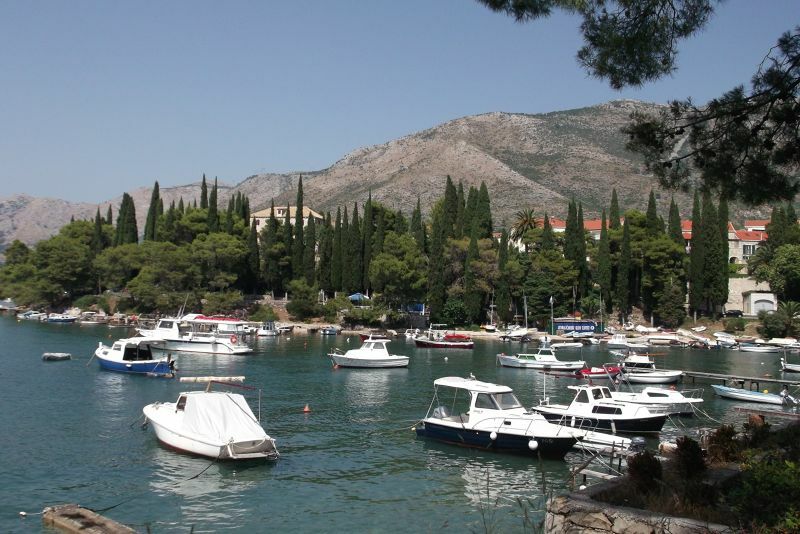 Cavtat is a really beautiful village with spectacular coastal scenery. 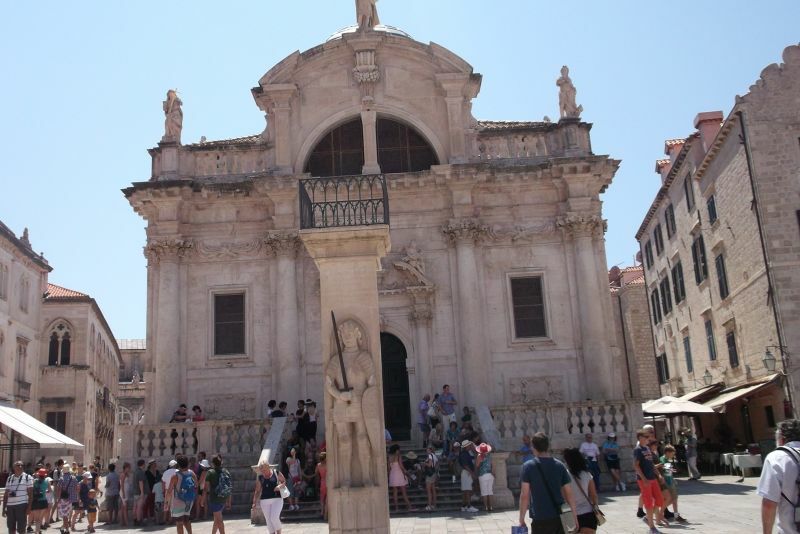 It is a pleasant place to visit and very easy to reach by bus from Dubrovnik. There are plenty of places to go for a swim in clear, blue waters here, too. 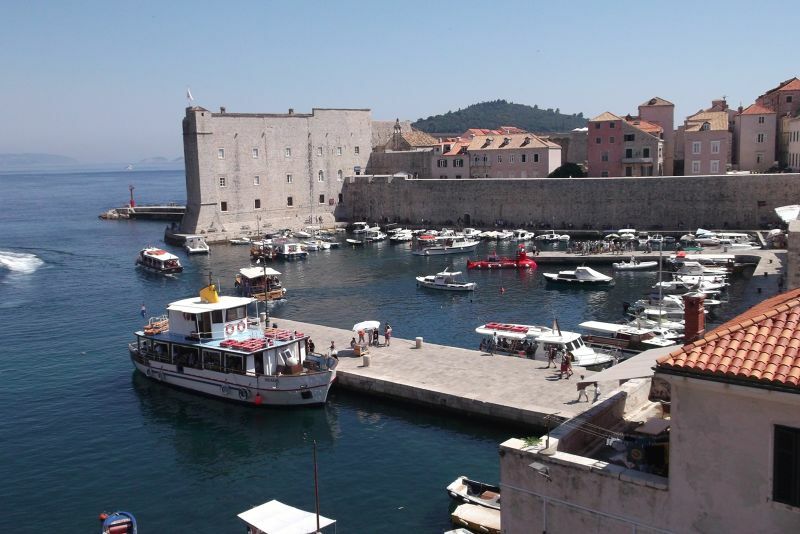 I have frequently seen the famous picture over Dubrovnik old town and old port and thought it looked stunning, so it has long been on my list of places to visit. However, as I started to research it, I read about it being unbearably hot, wall to wall people and over-priced. As it got nearer time to visit, I almost did not want to go. I thought how disappointed I would be when it did not live up to my expectations. 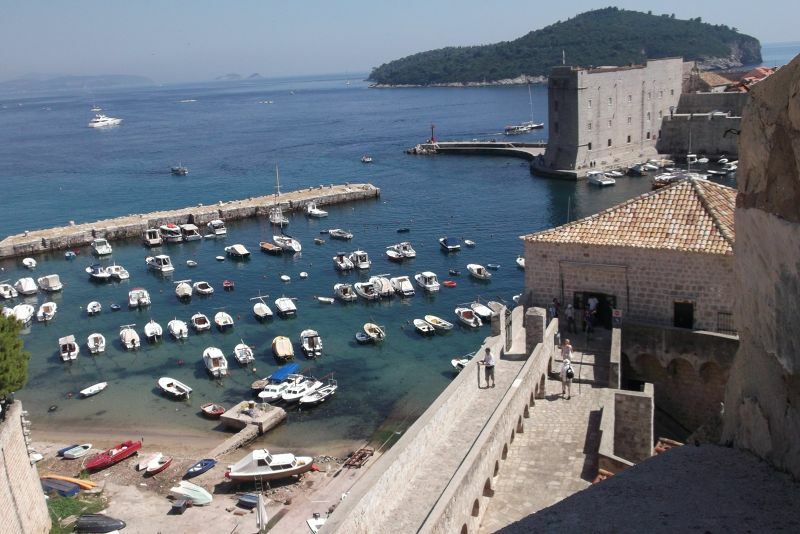 In the end Dubrovnik was fine. It was a beautiful old city. There were places to go to escape the crowds and the crowds were not as bad as either Hong Kong or Rome where we went last Christmas. 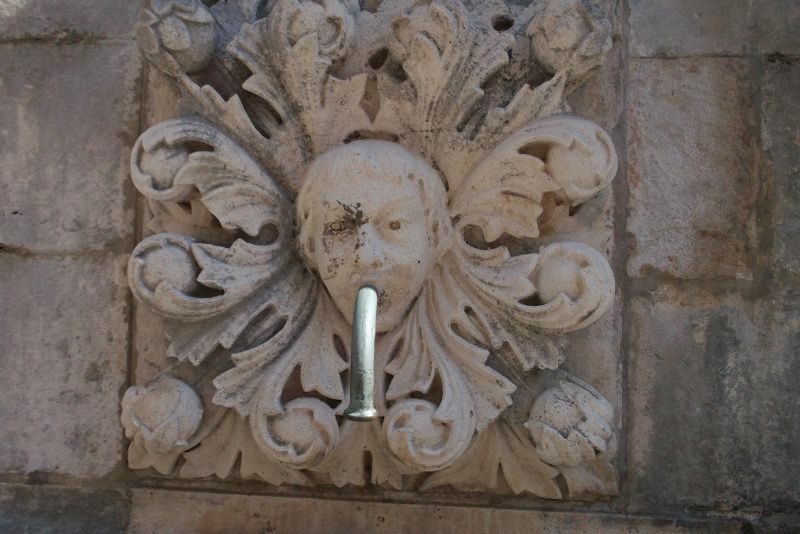 It was hot but there were fountains where you could sprinkle cold water on your face and fill your water bottle. 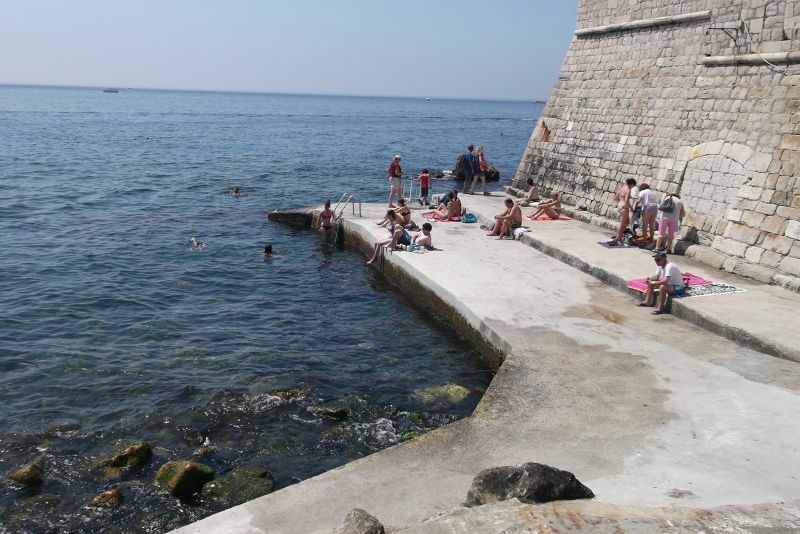 You were also never far from places where you could leap in the sea for a refreshing swim. 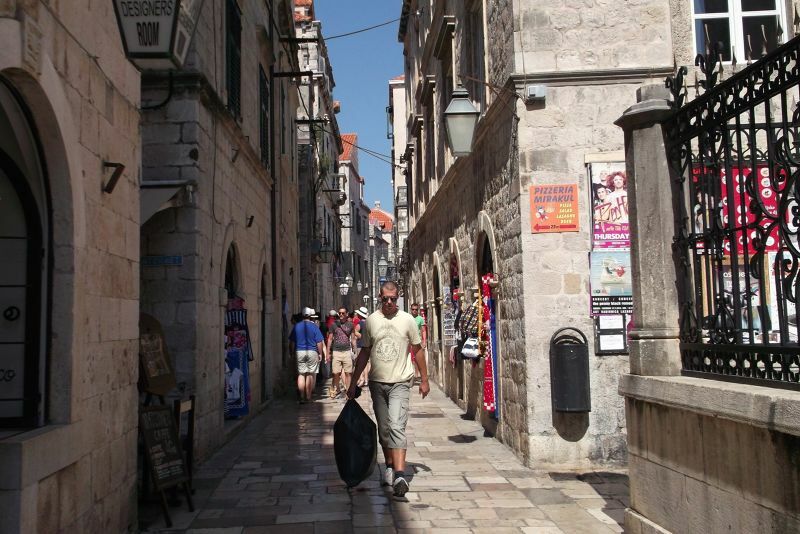 During our visit to the old town we paid to walk the walls, but other than getting there and back spent nothing else. It really does not deserve the bad press it gets. 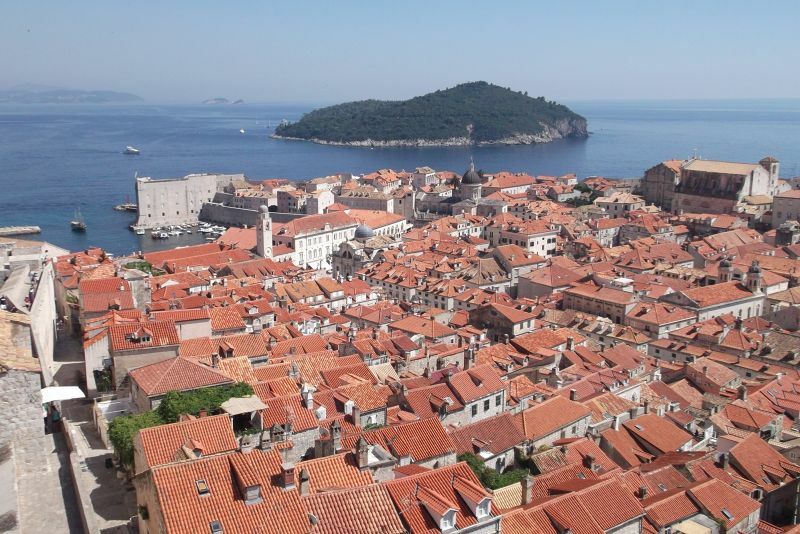 Dubrovnik is one of these places which, although I had researched it and had a map with all the sights marked on it, as soon as I got there I just wanted to wander aimlessly. Why? Well, because it is all lovely. When you have the strength to cope with crowds and sun visit the flat centre, as you tire of that seek out a quiet shady side street. Had enough of old buildings? 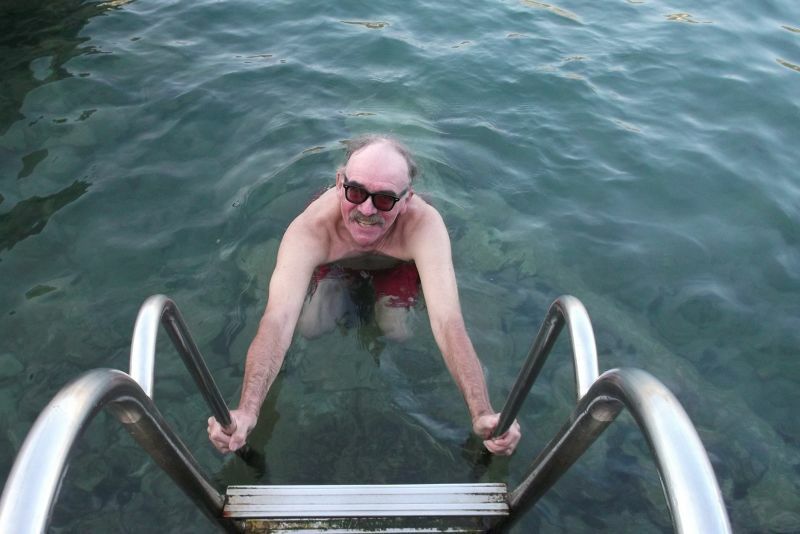 Leap in the sea and cool off and relax for a while. It has it all. 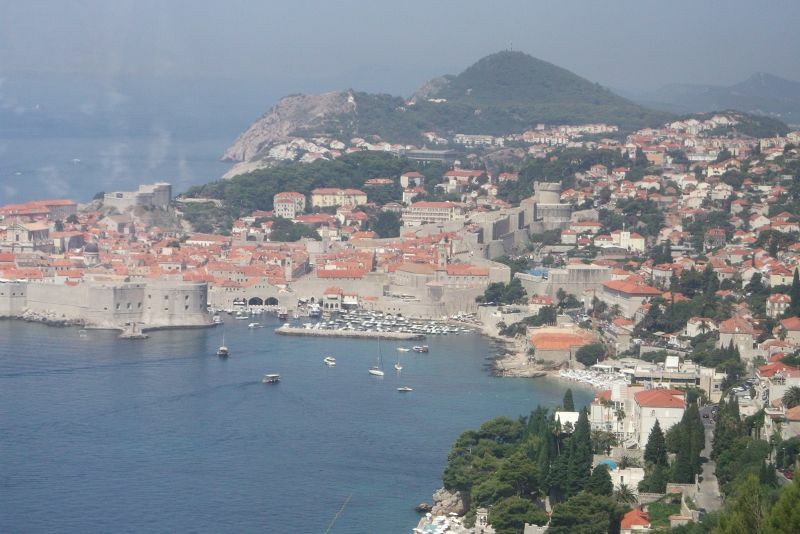 We only had an evening and two full days in Dubrovnik. While there are many things that are easy to do, it was so hot we had to get out of the sun for a while during daylight hours to cool down and avoid sunstroke. 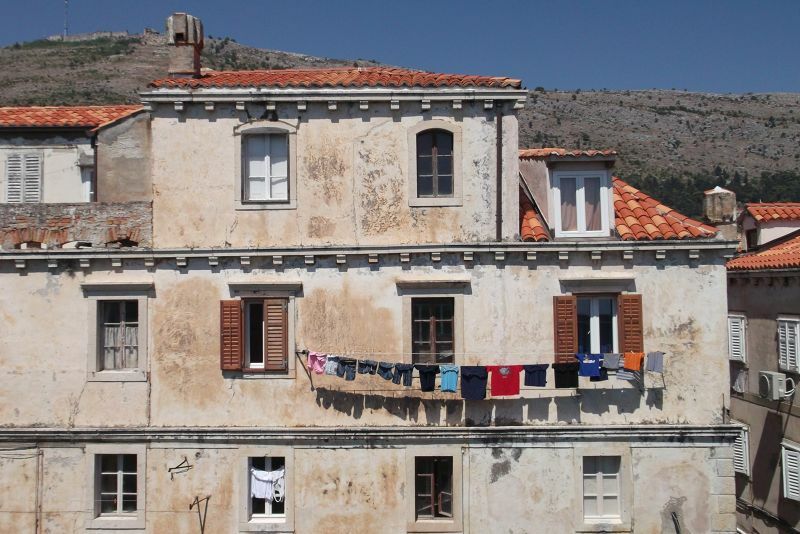 We spent our time exploring Gruz where we lived, the old town, Cavtat and Babin Kuk. Villa Amfora: Service could be better. This accomodation is in Gruz. Exit the main bus station, cross the road. Facing away from the sea, go right and walk for about 10 minutes. The rooms are above the Villa Amfora Restaurant. When we arrived there was no-one manning the reception desk. We approached 3 people before we could check in. Eventually we were shown to our room which was clean and comfortable. The bed was comfortable, there was a fridge, two bottles of water were provided on the first day. There was no safe and no tea/coffee making facilities. I asked for a map of the local area, but they did not have one. We liked the Gruz area for restaurants. It was easy to get into the old town by taking bus number 1A or 1B from across the road near the sea. Buy your ticket from the Tisak booth and remember to stamp it on the bus. 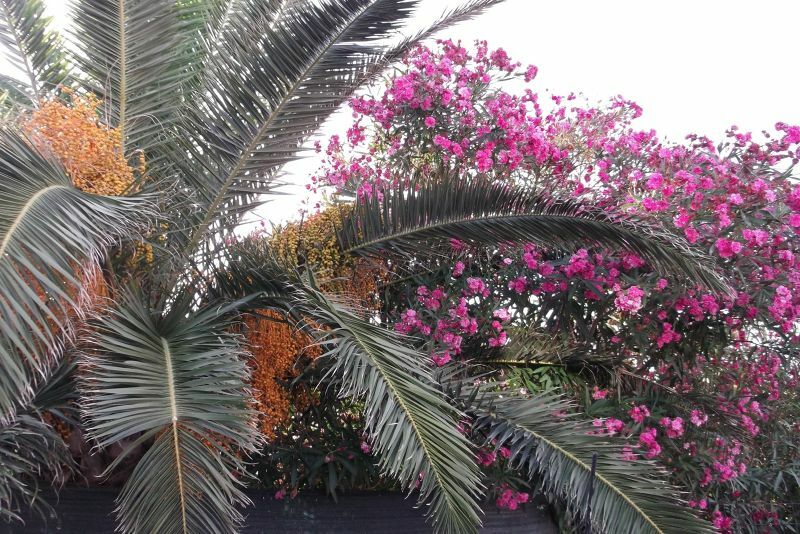 The Villa Amfora is close to bakeries and supermarkets. Our room was quiet at night and we slept well. The main negative about this place is that it is really a restaurant and the accommodation is very much secondary. There is no-one to ask for information. When I asked staff about buses to the old town, they claimed they did not know. I found out all the information I needed from the waitress in a much friendlier restaurant further up the street. We met the owner of the Villa Amfora on the last day of our stay when we checked out. I told him there should be someone manning the reception desk or at least a bell for summoning someone. It would have made a difference to us if the staff had been a bit more friendly and welcoming. We were put off right away from the disinterest shown when we checked in. I don't need people to be friendly or gushing, but to have to approach 3 members of staff before one bothers to check us in is unacceptable. Our other complaint is that our room was not cleaned on our second day despite the fact we were out all day. We returned in the evening to find clean towels left on the ironing board outside the door, but no attempt had been made to do anything in the room. This also put me off the place in a big way. 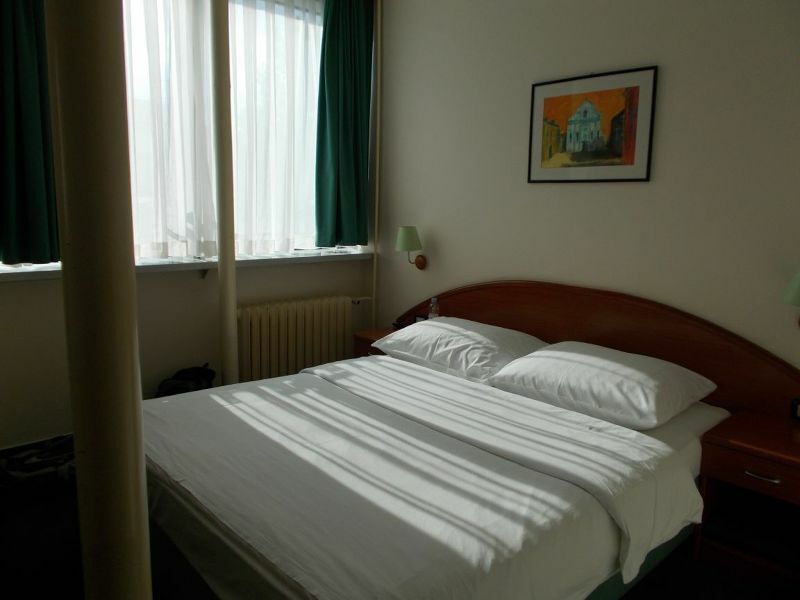 As Gruz is an excellent location and the room was comfortable and quiet, this place could be really good with a bit more effort from the staff. We had intended to eat in the restaurant here too, as it is supposed to be good but again as we were not impressed with the staff did not do so. 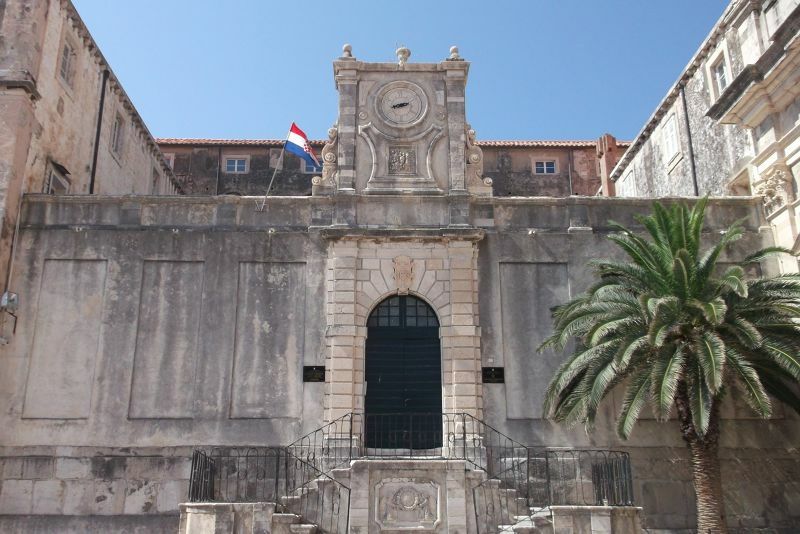 Address: Obala Stjepana Radica 26, Dubrovnik, 21000, Croatia. Our hotel was in Gruz. We were quite happy with this area for a number of reasons. 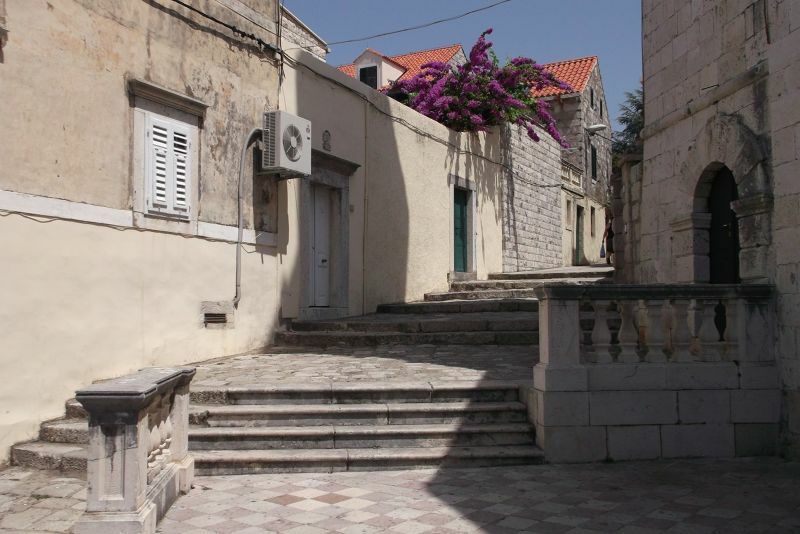 1/ It was close to the bus station and we arrived by bus from Mostar. 2/ It was close to the port and if we had had longer, we could have easily sailed off to an island. 3/ It was easy to get to the old town by bus 1A or 1B. 4/ There were several good restaurants here. 5/ Gruz has a lovely little church and a pretty harbour. 6/ Gruz has several supermarkets and bakeries. 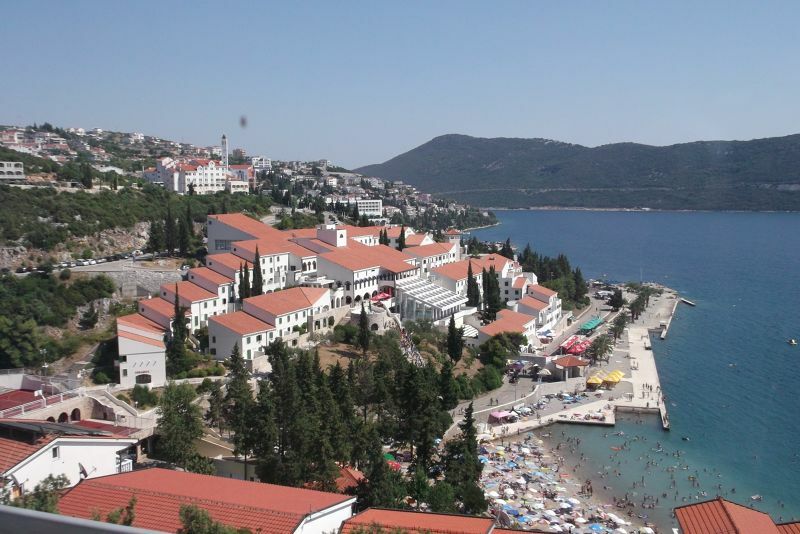 It's hot and tiring and costs 90 kunas, but it is well worth doing because the views over the town and port are fantastic. I went up near the Pile Gate and exited at the same place. I could have exited earlier at 2 places. The whole walk took me 1 hour 15 minutes at a leisurely pace. View from the city walls. 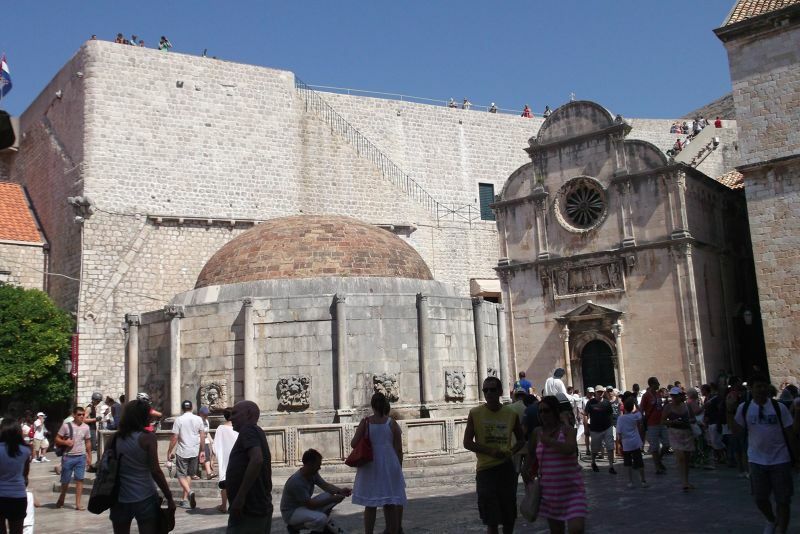 When you enter Dubrovnik at the Pile Gate you will see Big Onofrio's Fountain. 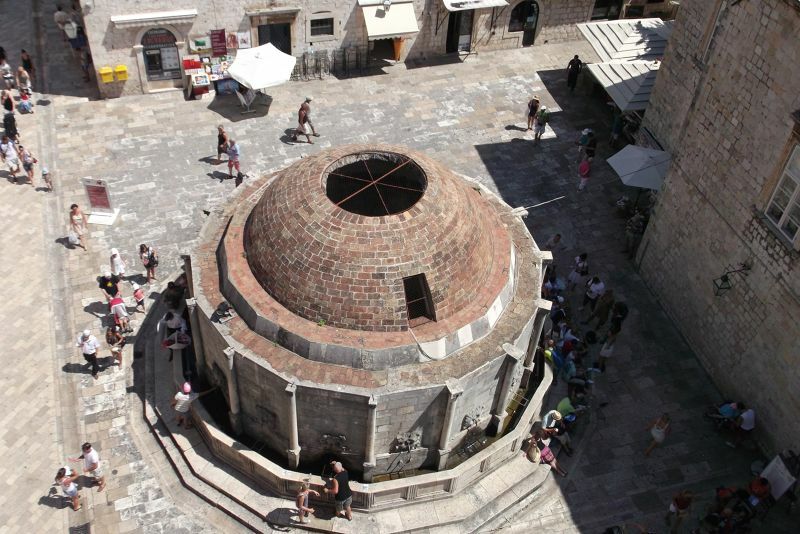 Near Ploce Gate you will find Small Onofrio's Fountain. 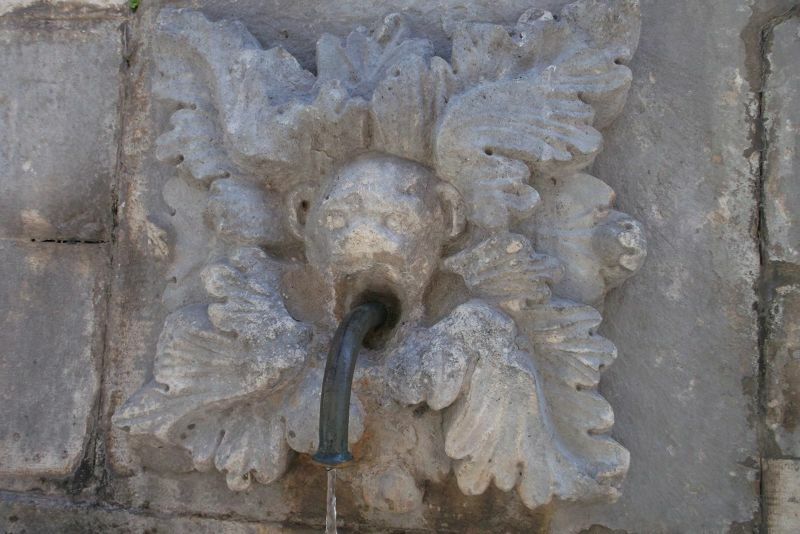 Their original purpose was for travellers to wash at before going into the city proper to prevent plague and disease. All these years later they are still useful for cooling down and refilling your water bottle. A true Godsend. 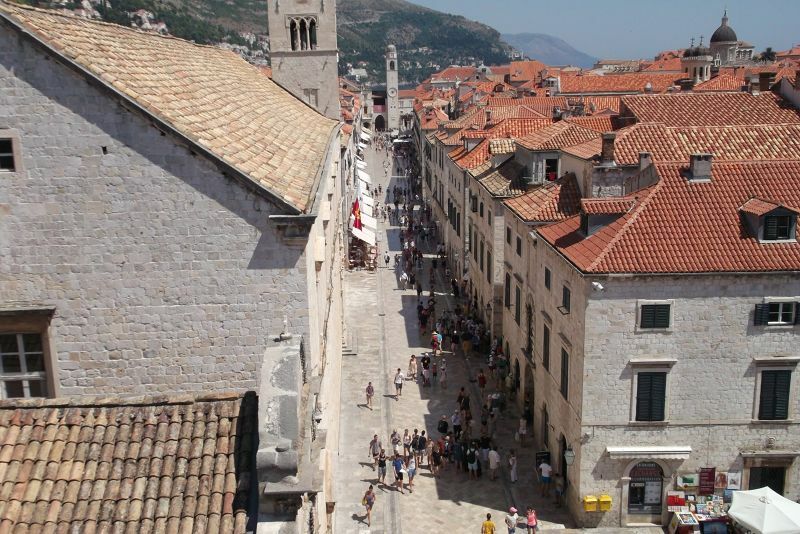 Stradun is the main street of the old town. 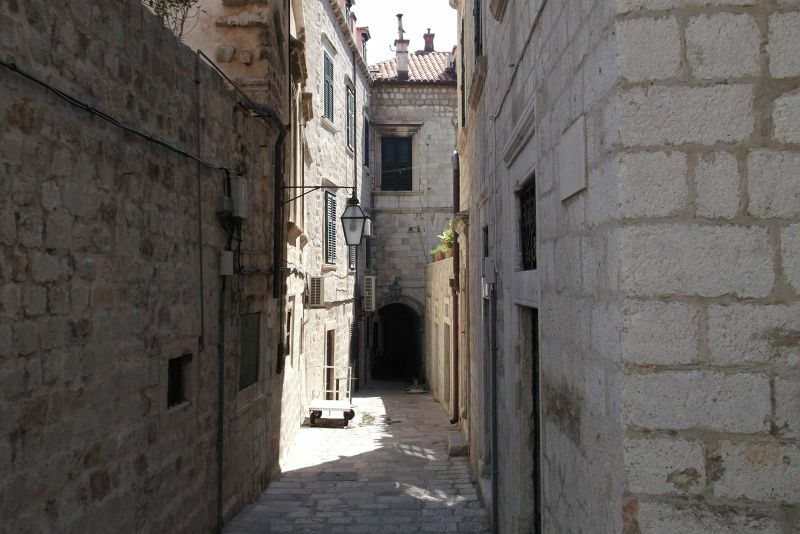 This street runs from the Pile to the Ploce Gate. It is a wide, sunny street lined with interesting buildings. It can be very crowded. 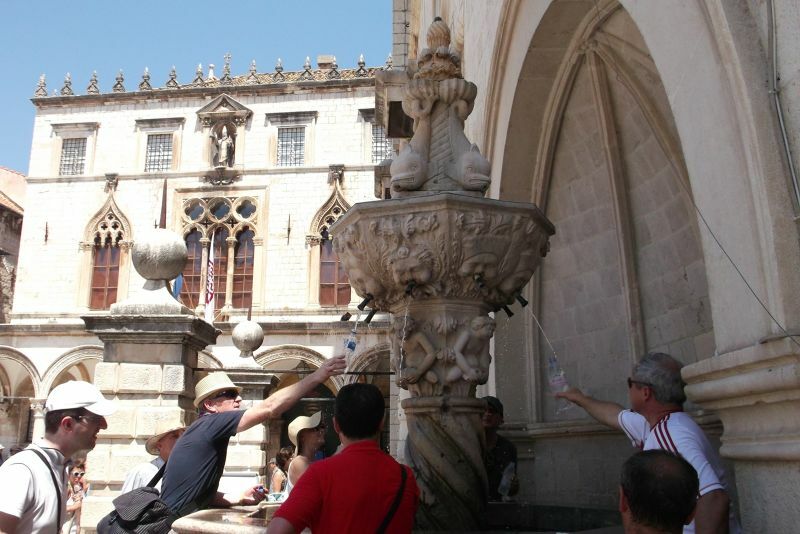 It starts at the Big Onofrio Fountain and St Saviour's Church, passes Orlando's Column and ends at small Onofrio's Fountain, the bell tower, Sponza Palace and the old port. I thought this was one of the loveliest areas of the old town. 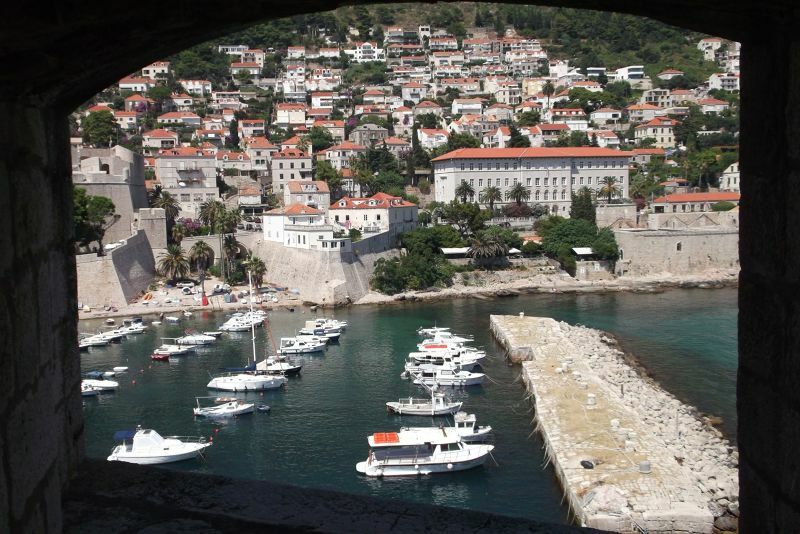 It had several shady seats, great views towards the old town, boat trips, ice-cream sellers and a swimming area. What more could you want? Swimming at the Old Port. 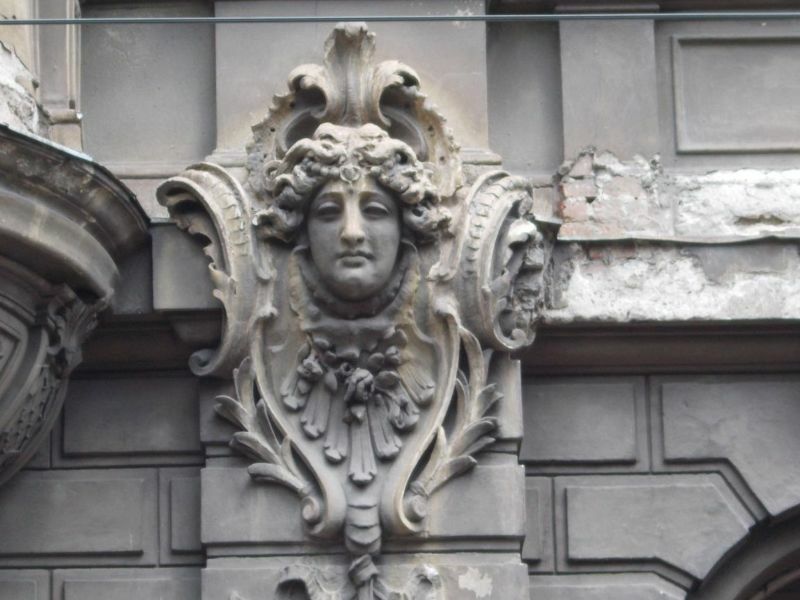 This beautifully ornate building is located on Pred Dvorom near the Old Port and the Cathedral. 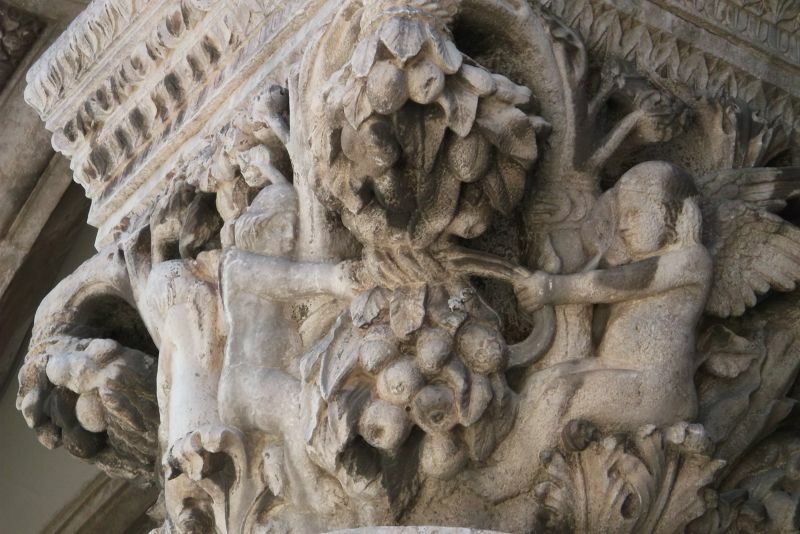 there are some lovely carvings above the arches at the front. 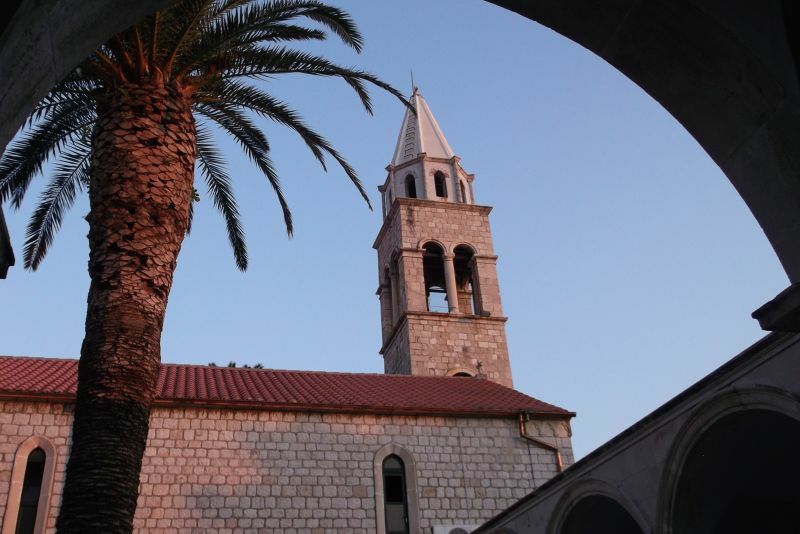 The Cathedral: Cathedral of the Assumption of the Virgin. 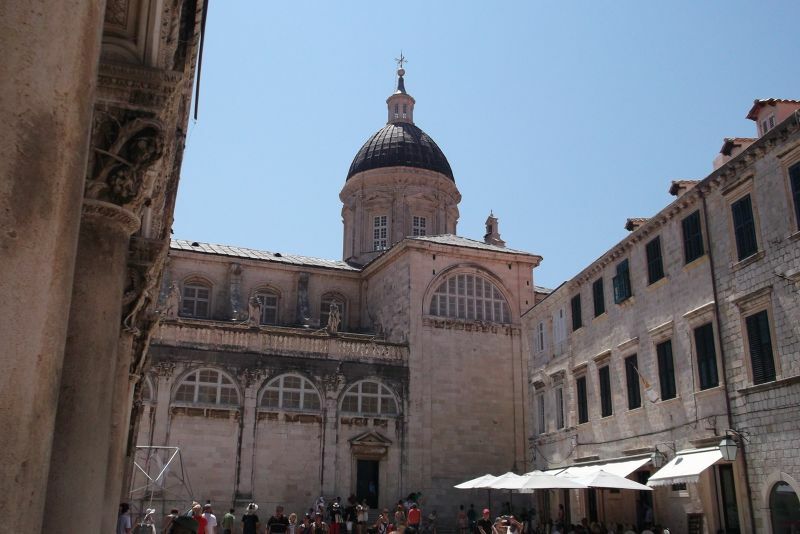 Dubrovnik's Cathedral is near the Rector's Palace. 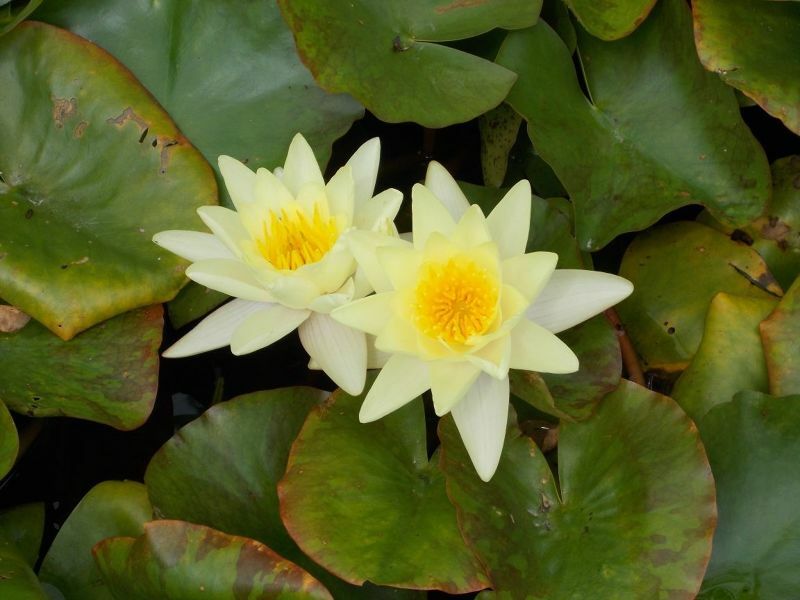 It is a pleasant building to sit in, take a rest and enjoy the peaceful surroundings. We visited more than once to escape the intense heat and have a bit of a rest. 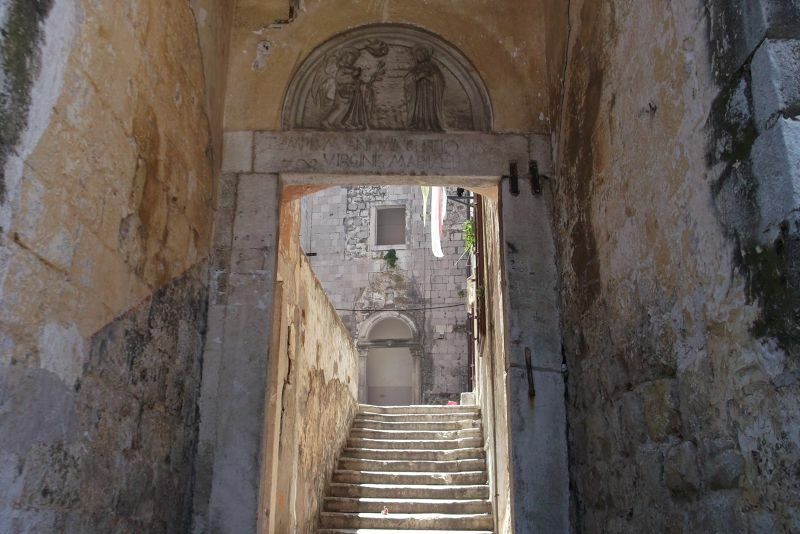 Walk through the market on Gundulic Square up a stairway modelled on the Spanish steps and you will reach the beautiful and peaceful Church of Ignatius. 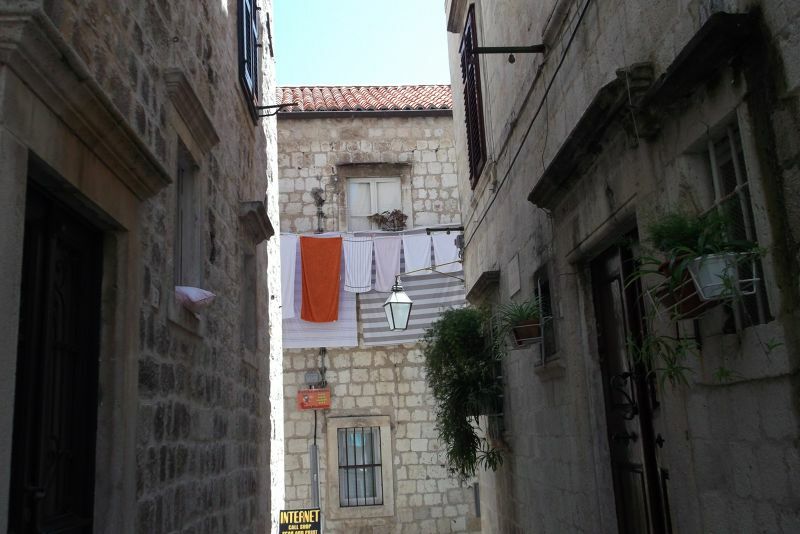 Side Streets in the Old City. 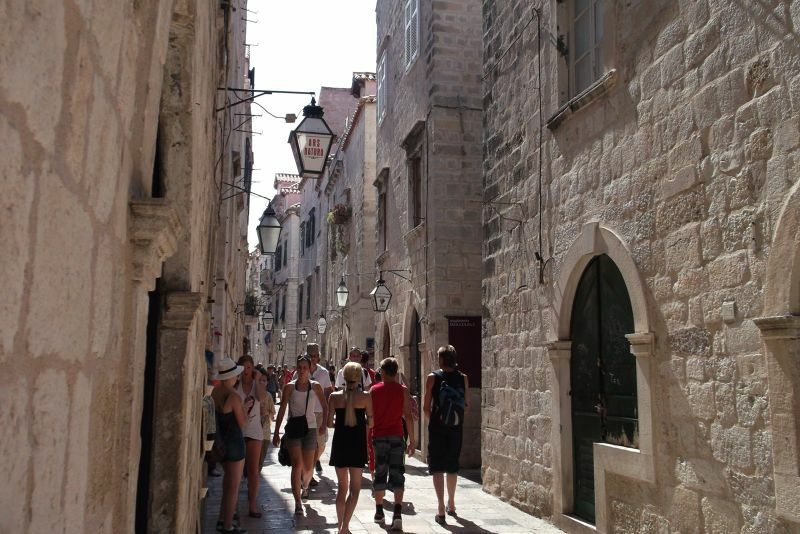 One of the best things to do in Dubrovnik is escape to the quieter shadier side streets. 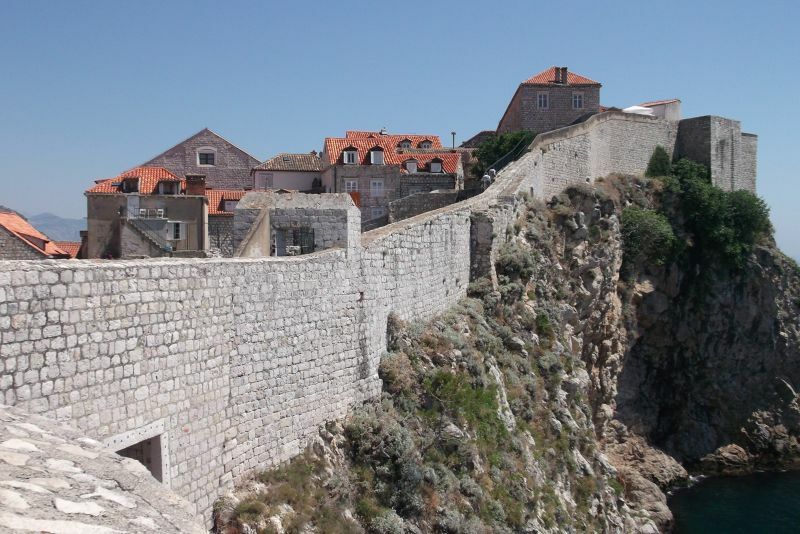 There is a good view of this lovey fort from outside the city walls near the Pile gate, but there is an even better view of it from the city walls. 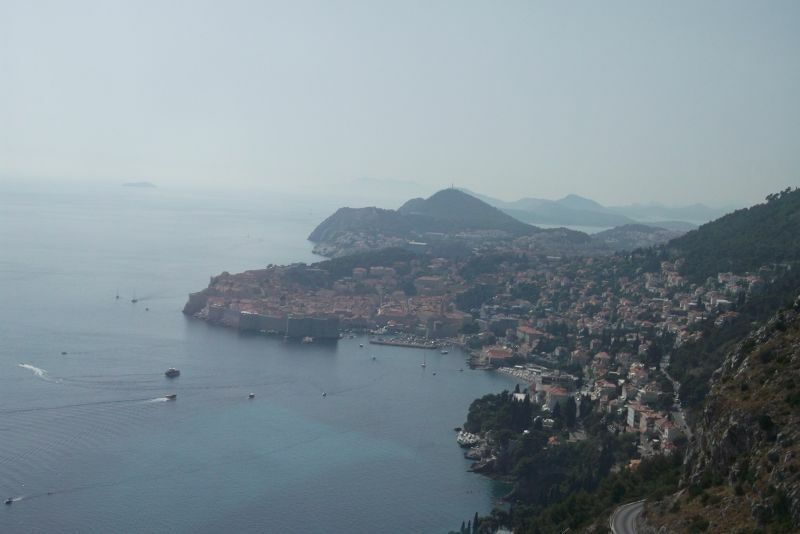 There is a famous view over Dubrovnik which I am very familiar with. I was not sure where to take it from.Then I had a look at Sandy Smith's VT page and she had the view and said she had seen it from the airport bus. We went to Cavtat for the day to make sure we passed that view and as I was getting ready to take it, on came the ticket inspectors. It took me ages to find my ticket and I almost missed the view all together ending up with not a great shot of it. I tried again on the way back - harder as we were then on the wrong side of the road. No worries we arrived by bus but were leaving by air so I could get it on the way to the airport. Guess what? The bus had painted windows - still I got a sort of check version of the view and I ended up buying the postcard. There is a viewing point on the way out of the town towards the airport where this view could easily be captured. 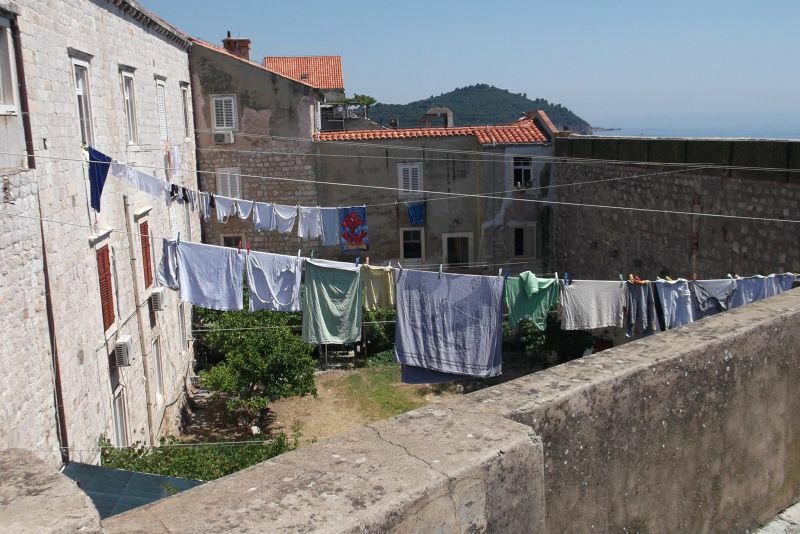 I don't know what it is about washing lines, but give me a beautiful setting and I want to photograph them. I think it is the fact that it brings home that this place is a living inhabited place, not a museum. 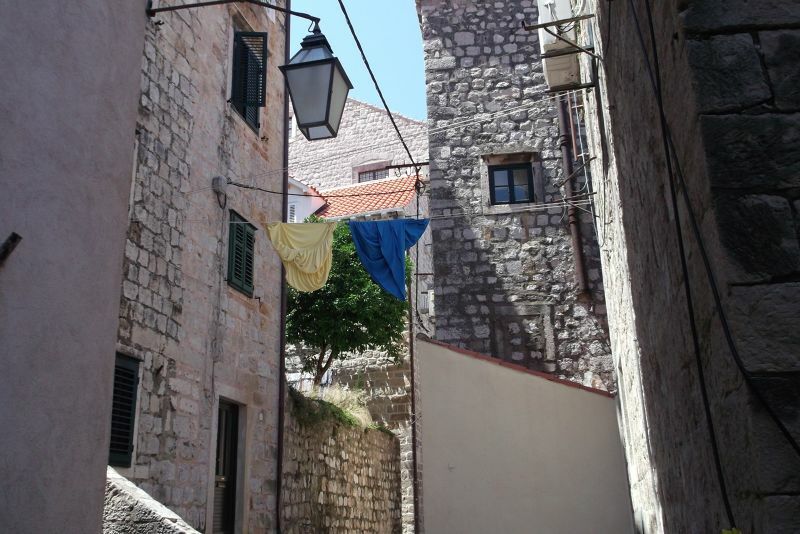 Anyway, there were plenty of great washing lines in the old town. We walked here from Gruz. It is just on the other side of the bay. On route we passed some vehicles used in the war. We also had a look at the beach area and had a swim. 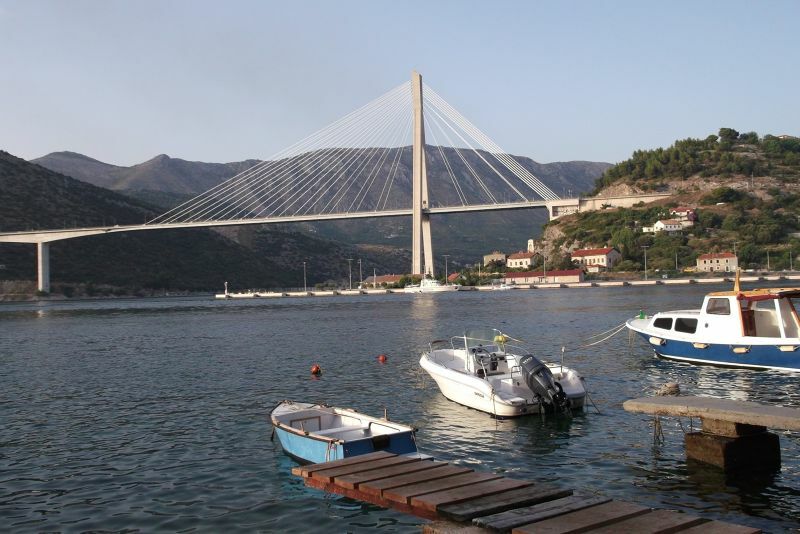 It was not great for swimming as there were too many boats, so we could not go out far and the water was not as clean as the other places we swam.There are good views of the bridge from here. Many hotels are here. The restaurants we passed here were noticeably more expensive than in Gruz. 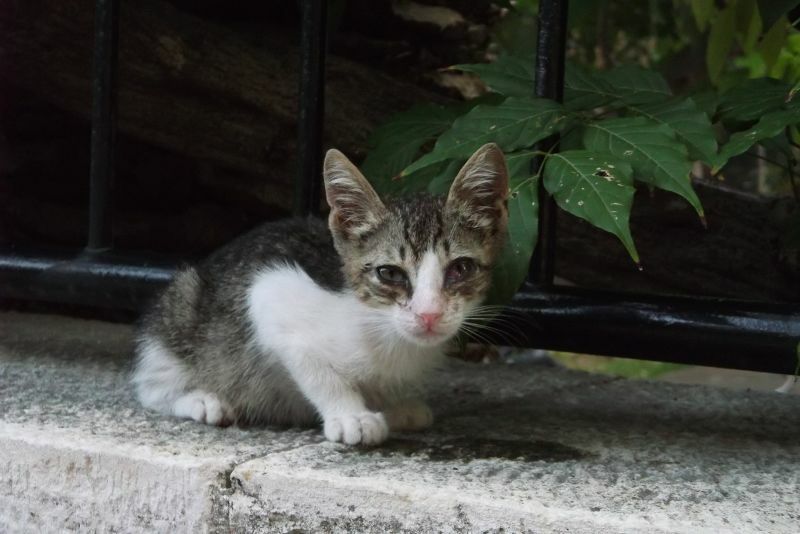 OK, I admit I have a thing about kittens, but, tell me, who could resist this little chap? For a start he is so tiny and then when you look into this big, big eyes, your heart just has to melt. Absolutely adorable! 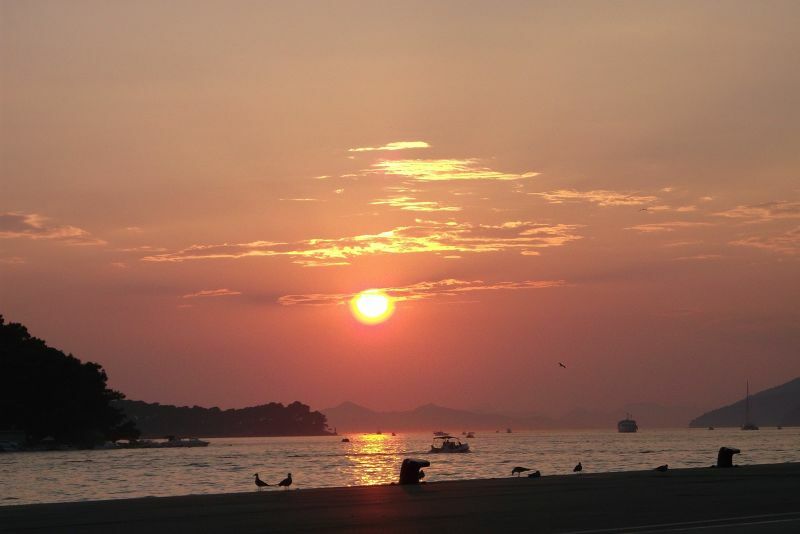 Dubrovnik has some lovely sunsets. These shots were not taken from a particularly lovely location even though I think they look attractive. They were taken from a car park as we walked back from a visit to a large supermarket not far from the bus station. 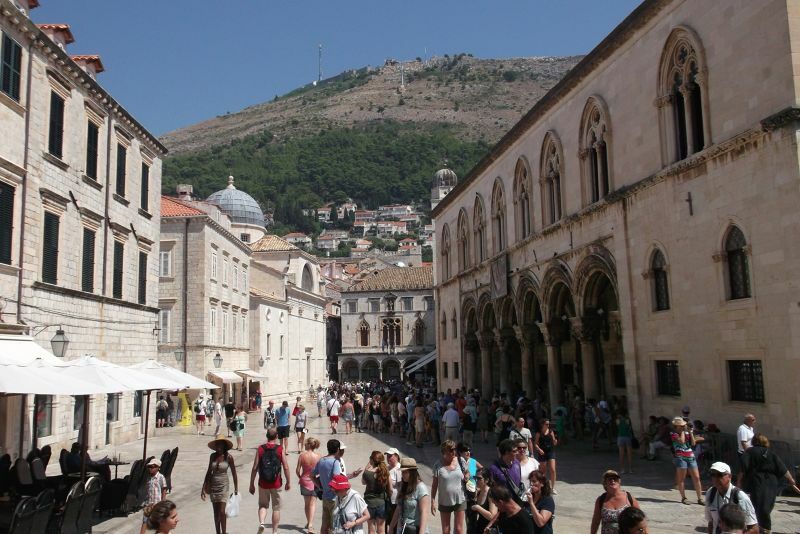 We used an Atlas bus from the bus station in Gruz to go to Dubrovnik Airport. The ticket cost 35 Kunas (5 Euros). No payment for check in luggage. It took just over half an hour.We bought our ticket on the bus. If you use the Libertas bus instead you buy your ticket before boarding the bus. The Libertas bus cost 40 Kunas. The Atlas bus timetable changes every 2 days. Its timetable for 2 days is displayed at the bus station. Airport buses depart from stand 8. 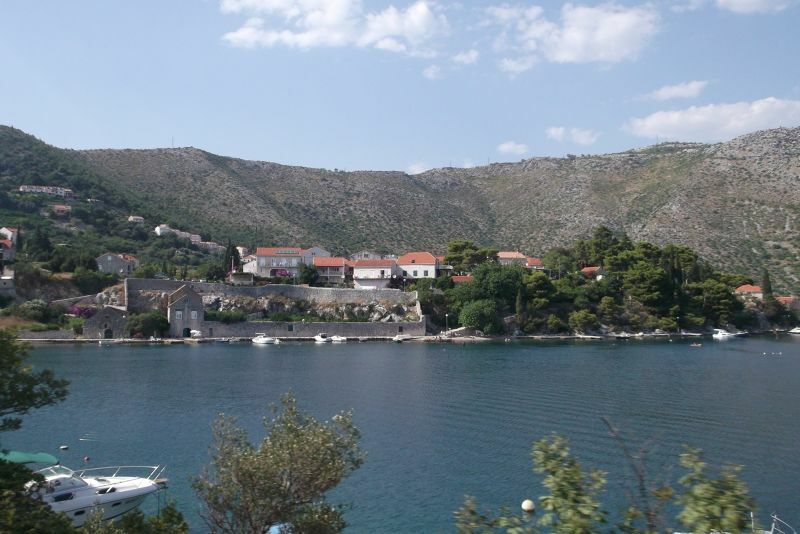 The number 10 bus goes from Gruz bus station to Cavtat. It cost 20 Kunas for a one way ticket. Buy your bus ticket from the bus driver; there is no need to stamp it in a machine. There are about 2 buses an hour. 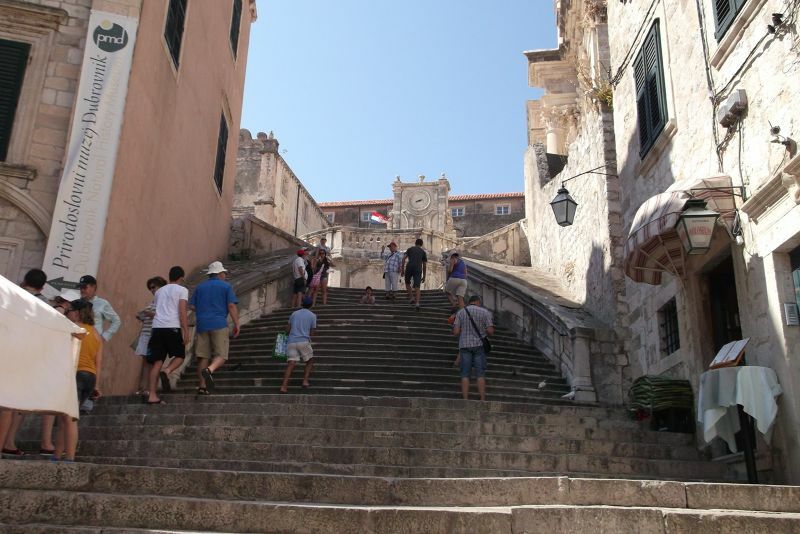 The bus service in Dubrovnik is quite user friendly. Buy tickets from a Tisak Kiosk. They cost 12 kunas each, 15 if you buy them on the bus. Tickets need to be stamped on the bus to validate them. 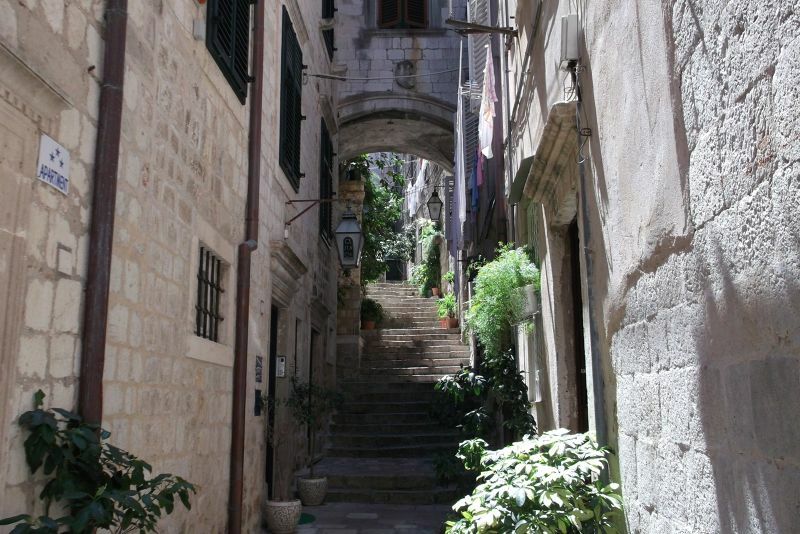 We used 1A and 1B to go from Gruz to the old town and number 10 from Gruz to Cavtat. 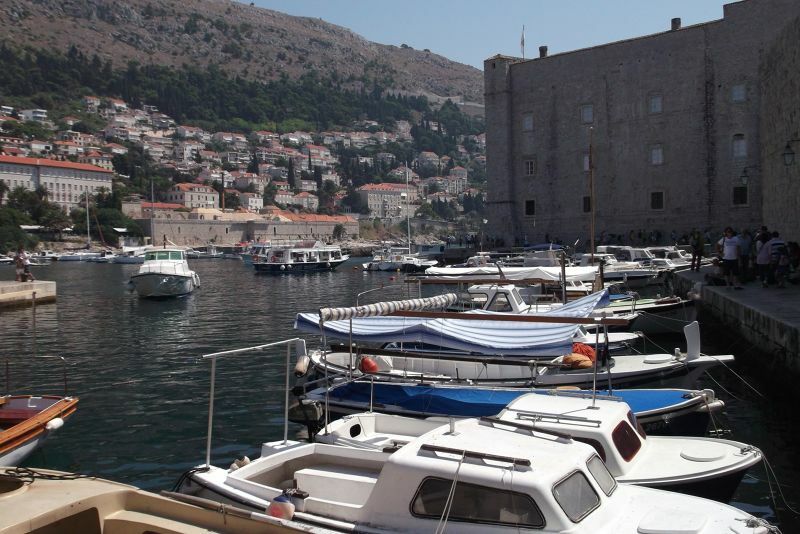 The Cavtat journey cost 20 kunas from the driver.